Ecology (from Greek: οἶκος, "house" or "living relations"; -λογία, "study of") is the scientific study of the distributions, abundance and relations of organisms and their interactions with the environment. Ecology includes the study of plant and animal populations, plant and animal communities and ecosystems. Ecosystems describe the web or network of relations among organisms at different scales of organization. Since ecology refers to any form of biodiversity, ecologists research everything from tiny bacteria's role in nutrient recycling to the effects of tropical rain forest on the Earth's atmosphere. The discipline of ecology emerged from the natural sciences in the late 19th century. Ecology is not synonymous with environment, environmentalism, or environmental science. Ecology is closely related to the disciplines of physiology, evolution, genetics and behavior. the abundance and distribution of biodiversity in context of the environment. Ecology is distinguished from natural history, which deals primarily with the descriptive study of organisms. It is a sub-discipline of biology, which is the study of life. There are many practical applications of ecology in conservation biology, wetland management, natural resource management (agriculture, forestry, fisheries), city planning (urban ecology), community health, economics, basic & applied science and it provides a conceptual framework for understanding and researching human social interaction (human ecology). The scale and dynamics of time and space must be carefully considered when describing ecological phenomena. In reference to time, it can take thousands of years for ecological processes to mature. The life-span of a tree, for example, can include different successional or seral stages leading to mature old-growth forests. The ecological process is extended even further through time as trees topple over, decay and provide critical habitat as nurse logs or coarse woody debris. In reference to space, the area of an ecosystem can vary greatly from tiny to vast. For example, a single tree is of smaller consequence to the classification of a forest ecosystem, but it is of larger consequence to smaller organisms. Several generations of an aphid population, for example, might exist on a single leaf. Inside each of those aphids exist diverse communities of bacteria. Tree growth is, in turn, related to local site variables, such as soil type, moisture content, slope of the land, and forest canopy closure. However, more complex global factors, such as climate, must be considered for the classification and understanding of processes leading to larger patterns spanning across a forested landscape. Global patterns of biological diversity are complex. This biocomplexity stems from the interplay among ecological processes that operate and influence patterns that grade into each other, such as transitional areas or ecotones that stretch across different scales. "Complexity in ecology is of at least six distinct types: spatial, temporal, structural, process, behavioral, and geometric. ":3 There are different views on what constitutes complexity. One perspective lumps things that we do not understand into this category by virtue of the computational effort it would require to piece together the numerous interacting parts. Alternatively, complexity in life sciences can be viewed as emergent self-organized systems with multiple possible outcomes directed by random accidents of history. Small scale patterns do not necessarily explain large scale phenomena, otherwise captured in the expression 'the sum is greater than the parts'. Ecologists have identified emergent and self-organizing phenomena that operate at different environmental scales of influence, ranging from molecular to planetary, and these require different sets of scientific explanation. Long-term ecological studies provide important track records to better understand the complexity of ecosystems over longer temporal and broader spatial scales. The International Long Term Ecological Network manages and exchanges scientific information among research sites. The longest experiment in existence is the Park Grass Experiment that was initiated in 1856. Another example includes the Hubbard Brook study in operation since 1960. To structure the study of ecology into a manageable framework of understanding, the biological world is conceptually organized as a nested hierarchy of organization, ranging in scale from genes, to cells, to tissues, to organs, to organisms, to species and up to the level of the biosphere. Together these hierarchical scales of life form a panarchy. Ecosystems are primarily researched at (but not restricted to) three key levels of organization, including organisms, populations, and communities. Ecologists study ecosystems by sampling a certain number of individuals that are representative of a population. Ecosystems consist of communities interacting with each other and the environment. In ecology, communities are created by the interaction of the populations of different species in an area. Biodiversity (an abbreviation of biological diversity) describes all varieties of life from genes to ecosystems and spans every level of biological organization. There are many ways to index, measure, and represent biodiversity. Biodiversity includes species diversity, ecosystem diversity, genetic diversity and the complex processes operating at and among these respective levels. Biodiversity plays an important role in ecological health as much as it does for human health. Preventing or prioritizing species extinctions is one way to preserve biodiversity, but populations, the genetic diversity within them and ecological processes, such as migration, are being threatened on global scales and disappearing rapidly as well. Conservation priorities and management techniques require different approaches and considerations to address the full ecological scope of biodiversity. Populations and species migration, for example, are more sensitive indicators of ecosystem services that sustain and contribute natural capital toward the well-being of humanity. An understanding of biodiversity has practical application for ecosystem-based conservation planners as they make ecologically responsible decisions in management recommendations to consultant firms, governments and industry. There are many definitions of the niche dating back to 1917, but George Evelyn Hutchinson made conceptual advances in 1957 and introduced the most widely accepted definition: "The niche is the set of biotic and abiotic conditions in which a species is able to persist and maintain stable population sizes. ":519 The ecological niche is a central concept in the ecology of organisms and is sub-divided into the fundamental and the realized niche. The fundamental niche is the set of environmental conditions under which a species is able to persist. The realized niche is the set of environmental plus ecological conditions under which a species persists. The habitat of a species is a related but distinct concept that describes the environment over which a species is known to occur and the type of community that is formed as a result. More specifically, "habitats can be defined as regions in environmental space that are composed of multiple dimensions, each representing a biotic or abiotic environmental variable; that is, any component or characteristic of the environment related directly (e.g. forage biomass and quality) or indirectly (e.g. elevation) to the use of a location by the animal. ":745 For example, the habitat might refer to an aquatic or terrestrial environment that can be further categorized as montane or alpine ecosystems. Biogeographical patterns and range distributions are explained or predicted through knowledge and understanding of a species traits and niche requirements. Species have functional traits that are uniquely adapted to the ecological niche. A trait is a measurable property of an organism that influences its performance. Traits of each species are suited ar uniquely adapted to their ecological niche. This means that resident species are at an advantage and able to competitively exclude other similarly adapted species from having an overlapping geographic range. This is called the competitive exclusion principle. Biodiversity of a coral reef. Corals adapt and modify their environment by forming calcium carbonate skeletons that provide growing conditions for future generations and form habitat for many other species. The ecosystem engineering concept has stimulated a new appreciation for the degree of influence that organisms have on the ecosystem and evolutionary process. The terms niche construction are more often used in reference to the under appreciated feedback mechanism of natural selection imparting forces on the abiotic niche. An example of natural selection through ecosystem engineering occurs in the nests of social insects, including ants, bees, wasps, and termites. There is an emergent homeostasis in the structure of the nest that regulates, maintains and defends the physiology of the entire colony. Termite mounds, for example, maintain a constant internal temperature through the design of air-conditioning chimneys. The structure of the nests themselves are subject to the forces of natural selection. Moreover, the nest can survive over successive generations, which means that ancestors inherit both genetic material and a legacy niche that was constructed before their time. Diatoms in the Bay of Fundy, Canada, provide another example of an ecosystem engineer. Benthic diatoms living in estuarine sediments secrete carbohydrate exudates that bind the sand and stabilizes the environment. The diatoms cause a physical state change in the properties of the sand that allows other organisms to colonize the area. The concept of ecosystem engineering brings new conceptual implications for the discipline of conservation biology. where N is the total number of individuals in the population, B is the number of births, D is the number of deaths, b and d are the per capita rates of birth and death respectively, and r is the per capita rate of population change. This formula can be read out as the rate of change in the population (dN/dT) is equal to births minus deaths (B – D). where N is the number of individuals measured as biomass density, a is the maximum per-capita rate of change, and K is the carrying capacity of the population. The formula can be read as follows: the rate of change in the population (dN/dT) is equal to growth (aN) that is limited by carrying capacity (1 – N/K). The discipline of population ecology builds upon these introductory models to further understand demographic processes in real study populations and conduct statistical tests. The field of population ecology often uses data on life history and matrix algebra to develop projection matrices on fecundity and survivorship. This information is used for managing wildlife stocks and setting harvest quotas. Populations are also studied and modeled according to the metapopulation concept. The metapopulation concept was introduced in 1969: "as a population of populations which go extinct locally and recolonize. ":105 Metapopulation ecology is another statistical approach that is often used in conservation research. Metapopulation research simplifies the landscape into patches of varying levels of quality. Metapopulation models have been used to explain life-history evolution, such as the ecological stability of amphibian metamorphosis in small vernal ponds. Alternative ecological strategies have evolved. For example, some salamanders forgo metamorphosis and sexually mature as aquatic neotenes. The seasonal duration of wetlands and the migratory range of the species determines which ponds are connected and if they form a metapopulation. The duration of the life history stages of amphibians relative to the duration of the vernal pool before it dries up regulates the ecological development of metapopulations connecting aquatic patches to terrestrial patches. In metapopulation terminology there are emigrants (individuals that leave a patch), immigrants (individuals that move into a patch) and sites are classed either as sources or sinks. A site is a generic term that refers to places where ecologists sample populations, such as ponds or defined sampling areas in a forest. Source patches are productive sites that generate a seasonal supply of juveniles that migrate to other patch locations. Sink patches are unproductive sites that only receive migrants and will go extinct unless rescued by an adjacent source patch or environmental conditions become more favorable. Metapopulation models examine patch dynamics over time to answer questions about spatial and demographic ecology. The ecology of metapopulations is a dynamic process of extinction and colonization. Small patches of lower quality (i.e., sinks) are maintained or rescued by a seasonal influx of new immigrants. A dynamic metapopulation structure evolves from year to year, where some patches are sinks in dry years and become sources when conditions are more favorable. Ecologists use a mixture of computer models and field studies to explain metapopulation structure. The concept of the ecosystem was first introduced in 1935 to describe habitats within biomes that form an integrated whole and a dynamically responsive system having both physical and biological complexes. Within an ecosystem there are inseparable ties that link organisms to the physical and biological components of their environment to which they are adapted. Ecosystems are complex adaptive systems where the interaction of life processes form self-organizing patterns across different scales of time and space. This section introduces key areas of ecosystem ecology that are used to inquire, understand and explain oberved patterns of biodiversity and ecosystem function across different scales of organization. Community ecology is a subdiscipline of ecology which studies the distribution, abundance, demography, and interactions between coexisting populations. An example of a study in community ecology might measure primary production in a wetland in relation to decomposition and consumption rates. This requires an understanding of the community connections between plants (i.e., primary producers) and the decomposers (e.g., fungi and bacteria). or the analysis of predator-prey dynamics affecting amphibian biomass. Food webs and trophic levels are two widely employed conceptual models used to explain the linkages among species. A food web is the archetypal ecological network. They are a type of concept map that illustrate pathways of energy flows in an ecological community, usually starting with solar energy being used by plants during photosynthesis. As plants grow, they accumulate carbohydrates and are eaten by grazing herbivores. Step by step lines or relations are drawn until a web of life is illustrated. There are different ecological dimensions that can be mapped to create more complicated food webs, including: species composition (type of species), richness (number of species), biomass (the dry weight of plants and animals), productivity (rates of conversion of energy and nutrients into growth), and stability (food webs over time). A food web diagram illustrating species composition shows how change in a single species can directly and indirectly influence many others. Microcosm studies are used to simplify food web research into semi-isolated units such as small springs, decaying logs, and laboratory experiments using organisms that reproduce quickly, such as daphnia feeding on algae grown under controlled environments in jars of water. Principles gleaned from food web microcosm studies are used to extrapolate smaller dynamic concepts to larger systems. Food webs are limited because they are generally restricted to a specific habitat, such as a cave or a pond. The food web illustration (right) only shows a small part of the complexity connecting the aquatic system to the adjacent terrestrial land. Many of these species migrate into other habitats to distribute their effects on a larger scale. In other words, food webs are incomplete, but are nonetheless a valuable tool in understanding community ecosystems. The Greek root of the word troph, τροφή, trophē, means food or feeding. Links in food-webs primarily connect feeding relations or trophism among species. Biodiversity within ecosystems can be organized into vertical and horizontal dimensions. The vertical dimension represents feeding relations that become further removed from the base of the food chain up toward top predators. The horizontal dimension represents the abundance or biomass at each level. When the relative abundance or biomass of each functional feeding group is stacked into their respective trophic levels they naturally sort into a ‘pyramid of numbers’. Functional groups are broadly categorized as autotrophs (or primary producers), heterotrophs (or consumers), and detrivores (or decomposers). Heterotrophs can be further sub-divided into different functional groups, including: primary consumers (strict herbivores), secondary consumers (predators that feed exclusively on herbivores) and tertiary consumers (predators that feed on a mix of herbivores and predators). Omnivores do not fit neatly into a functional category because they eat both plant and animal tissues. It has been suggested, however, that omnivores have a greater functional influence as predators because relative to herbivores they are comparatively inefficient at grazing. Ecologist collect data on trophic levels and food webs to statistically model and mathematically calculate parameters, such as those used in other kinds of network analysis (e.g., graph theory), to study emergent patterns and properties shared among ecosystems. The emergent pyramidal arrangement of trophic levels with amounts of energy transfer decreasing as species become further removed from the source of production is one of several patterns that is repeated amongst the planets ecosystems. The size of each level in the pyramid generally represents biomass, which can be measured as the dry weight of an organism. Autotrophs may have the highest global proportion of biomass, but they are closely rivaled or surpassed by microbes. The decomposition of dead organic matter, such as leaves falling on the forest floor, turns into soils that feed plant production. The total sum of the planet's soil ecosystems is called the pedosphere where a very large proportion of the Earth's biodiversity sorts into other trophic levels. Invertebrates that feed and shred larger leaves, for example, create smaller bits for smaller organisms in the feeding chain. Collectively, these are the detrivores that regulate soil formation. Tree roots, fungi, bacteria, worms, ants, beetles, centipedes, spiders, mammals, birds, reptiles, amphibians and other less familiar creatures all work to create the trophic web of life in soil ecosystems. As organisms feed and migrate through soils they physically displace materials, which is an important ecological process called bioturbation. Biomass of soil microorganisms are influenced by and feed back into the trophic dynamics of the exposed solar surface ecology. Paleoecological studies of soils places the origin for bioturbation to a time before the Cambrian period. Other events, such as the evolution of trees and amphibians moving into land in the Devonian period played a significant role in the development of soils and ecological trophism. Functional trophic groups sort out hierarchically into pyramidic trophic levels because it requires specialized adaptations to become a photosynthesizer or a predator, so few organisms have the adaptations needed to combine both abilities. This explains why functional adaptations to trophism (feeding) organizes different species into emergent functional groups. Trophic levels are part of the holistic or complex systems view of ecosystems. Each trophic level contains unrelated species that grouped together because they share common ecological functions. Grouping functionally similar species into a trophic system gives a macroscopic image of the larger functional design. Links in a food-web illustrate direct trophic relations among species, but there are also indirect effects that can alter the abundance, distribution, or biomass in the trophic levels. For example, predators eating herbivores indirectly influence the control and regulation of primary production in plants. Although the predators do not eat the plants directly, they regulate the population of herbibores that are directly linked to plant trophism. The net effect of direct and indirect relations is called trophic cascades. Trophic cascades are separated into species-level cascades, where only a subset of the food-web dynamic is impacted by a change in population numbers, and community-level cascades, where a change in population numbers has a dramatic effect on the entire food-web, such as the distribution of plant biomass. A keystone species is a species that is disproportionately connected to more species in the food-web. Keystone species have lower levels of biomass in the trophic pyramid relative to the importance of their role. The many connections that a keystone species holds means that it maintains the organization and structure of entire communities. The loss of a keystone species results in a range of dramatic cascading effects that alters trophic dynamics, other food-web connections and can cause the extinction of other species in the community. Sea otters (Enhydra lutris) are commonly cited as an example of a keystone species because they limit the density of sea urchins that feed on kelp. If sea otters are removed from the system, the urchins graze until the kelp beds disappear and this has a dramatic effect on community structure. Hunting of sea otters, for example, is thought to have indirectly led to the extinction of the Steller's Sea Cow (Hydrodamalis gigas). While the keystone species concept has been used extensively as a conservation tool, it has been criticized for being poorly defined from an operational stance. It is very difficult to experimentally determine in each different ecosystem what species may hold a keystone role. Furthermore, food-web theory suggests that keystone species may not be all that common. It is therefore unclear how generally the keystone species model can be applied. Ecological units of organization are defined through reference to any magnitude of space and time on the planet. Communities of organisms, for example, are somewhat arbitrarily defined, but the processes of life integrate at different levels and organize into more complex wholes. Biomes, for example, are a larger unit of organization that categorize regions of the Earth's ecosystems mainly according to the structure and composition of vegetation. Different researchers have applied different methods to define continental boundaries of biomes dominated by different functional types of vegetative communities that are limited in distribution by climate, precipitation, weather and other environmental variables. Examples of biome names include: tropical rainforest, temperate broadleaf and mixed forests, temperate deciduous forest, taiga, tundra, hot desert, and polar desert. Other researchers have recently started to categorize other types of biomes, such as the human and oceanic microbiomes. To a microbe, the human body is a habitat and a landscape. The microbiome has been largely discovered through advances in molecular genetics that have revealed a hidden richness of microbial diversity on the planet. The oceanic microbiome plays a significant role in the ecological biogeochemistry of the planet's oceans. Ecological theory has been used to explain self-emergent regulatory phenomena at the planetary scale. The largest scale of ecological organization is the biosphere: the total sum of ecosystems on the planet. Ecological relations regulate the flux of energy, nutrients, and climate all the way up to the planetary scale. For example, the dynamic history of the planetary CO2 and O2 composition of the atmosphere has been largely determined by the biogenic flux of gases coming from respiration and photosynthesis, with levels fluctuating over time and in relation to the ecology and evolution of plants and animals. When sub-component parts are organized into a whole there are oftentimes emergent properties that describe the nature of the system. This the Gaia hypothesis, and is an example of holism applied in ecological theory. The ecology of the planet acts as a single regulatory or holistic unit called Gaia. The Gaia hypothesis states that there is an emergent feedback loop generated by the metabolism of living organisms that maintains the temperature of the Earth and atmospheric conditions within a narrow self-regulating range of tolerance. Ecology and evolution are considered sister disciplines of the life sciences. Natural selection, life history, development, adaptation, populations, and inheritance are examples of concepts that thread equally into ecological and evolutionary theory. Morphological, behavioural and/or genetic traits, for example, can be mapped onto evolutionary trees to study the historical development of a species in relation to their functions and roles in different ecological circumstances. In this framework, the analytical tools of ecologists and evolutionists overlap as they organize, classify and investigate life through common systematic principals, such as phylogenetics or the Linnaean system of taxonomy. The two disciplines often appear together, such as in the title of the journal Trends in Ecology and Evolution. There is no sharp boundary separating ecology from evolution and they differ more in their areas of applied focus. Both disciplines discover and explain emergent and unique properties and processes operating across different spatial or temporal scales of organization. While the boundary between ecology and evolution is not always clear, it is understood that ecologists study the abiotic and biotic factors that influence the evolutionary process. Social display and color variation in differently adapted species of chameleons (Bradypodion spp.). Chameleons change their skin color to match their background as a behavioral defense mechanism and also use color to communicate with other members of their species, such as dominant (left) versus submissive (right) patterns shown in the three species (A-C) above. All organisms are motile to some extent. 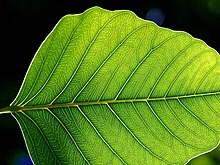 Even plants express complex behavior, including memory and communication. Behavioural ecology is the study of ethology and its ecological and evolutionary implications. Ethology is the study of observable movement or behaviour in nature. This could include investigations of motile sperm of plants, mobile phytoplankton, zooplankton swimming toward the female egg, the cultivation of fungi by weevils, the mating dance of a salamander, or social gatherings of amoeba. Adaptation is the central unifying concept in behavioral ecology. "International Society for Behavioral Ecology". http://www.behavecol.com/pages/society/welcome.html. Behaviors can be recorded as traits and inherited in much the same way that eye and hair color can. Behaviours evolve and become adapted to the ecosystem because they are subject to the forces of natural selection. Hence, behaviors can be adaptive, meaning that they evolve functional utilities that increases reproductive success for the individuals that inherit such traits. This is also the technical definition for fitness in biology, which is a measure of reproductive success over successive generations. "The threat-sensitive predator avoidance hypothesis predicts that prey should assess the degree of threat posed by different predators and match their behavior according to current levels of risk." "The optimal flight initiation distance occurs where expected postencounter fitness is maximized, which depends on the prey’s initial fitness, benefits obtainable by not fleeing, energetic escape costs, and expected fitness loss due to predation risk." The behaviour of long-toed salamanders (Ambystoma macrodactylum) presents an example in this context. When threatened, the long-toed salamander defends itself by waving its tail and secreting a white milky fluid. The excreted fluid is distasteful, toxic and adhesive, but it is also used for nutrient and energy storage during hibernation. Hence, salamanders subjected to frequent predatory attack will be energetically compromised as they use up their energy stores. Ecological interactions can be divided into host and associate relationships. A host is any entity that harbors another that is called the associate. Host and associate relationships among species that are mutually or reciprocally beneficial are called mutualisms. If the host and associate are physically connected, the relationship is called symbiosis. Approximately 60% of all plants, for example, have a symbiotic relationship with arbuscular mycorrhizal fungi. Symbiotic plants and fungi exchange carbohydrates for mineral nutrients. Symbiosis differs from indirect mutualisms where the organisms live apart. For example, tropical rainforests regulate the Earth's atmosphere. Trees living in the equatorial regions of the planet supply oxygen into the atmosphere that sustains species living in distant polar regions of the planet. This relationship is called commensalism because many other host species receive the benefits of clean air at no cost or harm to the associate tree species supplying the oxygen. The host and associate relationship is called parasitism if one species benefits while the other suffers. Competition among species or among members of the same species is defined as reciprocal antagonism, such as grasses competing for growth space. Popular ecological study systems for mutualism include, fungus-growing ants employing agricultural symbiosis, bacteria living in the guts of insects and other organisms, the fig wasp and yucca moth pollination complex, lichens with fungi and photosynthetic algae, and corals with photosynthetic algae. Intraspecific behaviours are notable in the social insects, slime moulds, social spiders, human society, and naked mole rats where eusocialism has evolved. Social behaviours include reciprocally beneficial behaviours among kin and nest mates. Social behaviours evolve from kin and group selection. Kin selection explains altruism through genetic relationships, whereby an altruistic behaviour leading to death is rewarded by the survival of genetic copies distributed among surviving relatives. The social insects, including ants, bees and wasps are most famously studied for this type of relationship because the male drones are clones that share the same genetic make-up as every other male in the colony. In contrast, group selectionists find examples of altruism among non-genetic relatives and explain this through selection acting on the group, whereby it becomes selectively advantageous for groups if their members express altruistic behaviours to one another. Groups that are predominantely altruists beat groups that are predominantely selfish. A often quoted behavioural ecology hypothesis is known as Lack's brood reduction hypothesis (named after David Lack). Lack's hypothesis posits an evolutionary and ecological explanation as to why birds lay a series of eggs with an asynchronous delay leading to nestlings of mixed age and weights. According to Lack, this brood behaviour is an ecological insurance that allows the larger birds to survive in poor years and all birds to survive when food is plentiful. Elaborate sexual displays and posturing are encountered in the behavioural ecology of animals. The birds of paradise, for example, display elaborate ornaments and song during courtship. These displays serve a dual purpose of signalling healthy or well-adapted individuals and good genes. The elaborate displays are driven by sexual selection as an advertisement of quality of traits among male suitors. The word biogeography is an amalgamation of biology and geography. Biogeography is the comparative study of the geographic distribution of organisms and the corresponding evolution of their traits in space and time. The Journal of Biogeography was established in 1974. Biogeography and ecology share many of their disciplinary roots. For example, the theory of island biogeography, published by the mathematician Robert MacArthur and ecologist Edward O. Wilson in 1967 is considered one of the fundamentals of ecological theory. Biogeography has a long history in the natural sciences where questions arise concerning the spatial distribution of plants and animals. Ecology and evolution provide the explanatory context for biogeographical studies. Biogeographical patterns result from ecological processes that influence range distributions, such as migration and dispersal. and from historical processes that split populations or species into different areas. The biogeographic processes that result in the natural splitting of species explains much of the modern distribution of the Earth's biota. The splitting of lineages in a species is called vicariance biogeography and it is a sub-discipline of biogeography. There are also practical applications in the field of biogeography concerning ecological systems and processes. For example, the range and distribution of biodiversity and invasive species responding to climate change is a serious concern and active area of research in context of global warming. Another concept that was introduced in MacArthur and Wilson's (1967) classical book, The Theory of Island Biogeography was r/K selection theory, which was one of the first predictive models in ecology that could be used to explain life-history evolution. The premise behind the r/K selection model is that the pressure of natural selection changes according to population densities. When an island is first colonized the density of individuals is low. The initial increase in population size is not limited by competition, which leaves an abundance of available resources for rapid population growth. These early phases of population growth experience density independent forces of natural selection, which is called r-selection. When the population becomes crowded, it reaches the island's carrying capacity, and individuals compete more heavily for fewer available resources. Under crowded conditions the population experiences density-dependent forces of natural selection, called K-selection. In the r/K-selection model, the first variable r is the intrinsic rate of natural increase in population size and the second variable K is the carrying capacity of a population. Different species evolve different life-history strategies spanning a continuum between these two selective forces. An r-selected species is one that has high birth rates, low levels of parental investment, and high rates of mortality before individuals reach maturity. Evolution favors high rates of fecundity in r-selected species. Many kinds of insects and invasive species exhibit r-selected characteristics. In contrast, a K-selected species has low rates of fecundity, high levels of parental investment in the young, and low rates of mortality as individuals mature. Humans and elephants are examples of species exhibiting K-selected characteristics, including longevity and efficiency in the conversion of more resources into fewer offspring. The important relationship between ecology and genetic inheritance predates modern techniques for molecular analysis. Molecular ecological research became more feasible with the development of rapid and accessible genetic technologies, such as the polymerase chain reaction (PCR). The rise of molecular technologies and influx of research questions into this new ecological field resulted in the publication Molecular Ecology in 1992. Molecular ecology uses various analytical techniques to study genes in an evolutionary and ecological context. In 1994, professor John Avise also played a leading role in this area of science with the publication of his book, Molecular Markers, Natural History and Evolution. Newer technologies opened a wave of genetic analysis into organisms once difficult to study from an ecological or evolutionary standpoint, such as bacteria, fungi and nematodes. Molecular ecology engendered a new research paradigm to investigate ecological questions considered otherwise intractable. Molecular investigations revealed previously obscured details in the tiny intricacies of nature and improved resolution into probing questions about behavioral and biogeographical ecology. For example, molecular ecology revealed promiscuous sexual behavior and multiple male partners in tree swallows previously thought to be socially monogamous. In a biogeographical context, the marriage between genetics, ecology and evolution resulted in a new sub-discipline called phylogeography. The environment is dynamically interlinked, imposed upon and constrains organisms at any time throughout their life cycle. Like the term ecology, environment has different conceptual meanings and to many these terms also overlap with the concept of nature. Environment "...includes the physical world, the social world of human relations and the built world of human creation. ":62 The environment in ecosystems includes both physical parameters and biotic attributes. The physical environment is external to the level of biological organization under investigation, including abiotic factors such as temperature, radiation, light, chemistry, climate and geology. The biotic environment includes genes, cells, organisms, members of the same species (conspecifics) and other species that share a habitat. The laws of thermodynamics applies to ecology by means of its physical state. Armed with an understanding of metabolic and thermodynamic principles a complete accounting of energy and material flow can be traced through an ecosystem. Environmental and ecological relations are studied through reference to conceptually manageable and isolated parts. However, once the effective environmental components are understood they conceptually link back together as a holocoenotic system. In other words, the organism and the environment form a dynamic whole (or umwelt). :252 Change in one ecological or environmental factor can concurrently affect the dynamic state of an entire ecosystem. Ecological studies are necessarily holistic as opposed to reductionistic. Holism has three scientific meanings or uses that identify with: 1) the mechanistic complexity of ecosystems, 2) the practical description of patterns in quantitative reductionist terms where correlations may be identified but nothing is understood about the causal relations without reference to the whole system, which leads to 3) a metaphysical hierarchy whereby the causal relations of larger systems are understood without reference to the smaller parts. An example of the metaphysical aspect to holism is the trend of increased exterior thickness in shells of different species. The reason for a thickness increase can be understood through reference to principals of natural selection via predation without any reference to the biomolecular properties of the exterior shells. The Earth formed approximately 4.5 billion years ago and environmental conditions were too extreme for life to form for the first 500 million years. During this early Hadean period, the Earth started to cool, allowing a crust and oceans to form. Environmental conditions were unsuitable for the origins of life for the first billion years after the Earth formed. The Earth's atmosphere transformed from being dominated by hydrogen, to one composed mostly of methane and ammonia. Over the next billion years the metabolic activity of life transformed the atmosphere to higher concentrations of carbon dioxide, nitrogen, and water vapor. These gases changed the way that light from the sun hit the Earth's surface and greenhouse effects trapped heat. There were untapped sources of free energy within the mixture of reducing and oxidizing gasses that set the stage for primitive ecosystems to evolve and, in turn, the atmosphere also evolved. Throughout history, the Earth's atmosphere and biogeochemical cycles have been in a dynamic equilibrium with planetary ecosystems. The history is characterized by periods of significant transformation followed by millions of years of stability. The evolution of the earliest organisms, likely anaerobic methanogen microbes, started the process by converting atmospheric hydrogen into methane (4H2 + CO2 → CH4 + 2H2O). Anoxygenic photosynthesis converting hydrogen sulfide into other sulfur compounds or water (2H2S + CO2 → hv → CH2O → H2O → + 2S or 2H2 + CO2 + hv → CH2O + H2O), as occurs in deep sea hydrothermal vents today, reduced hydrogen concentrations and increased atmospheric methane. Early forms of fermentation also increased levels of atmospheric methane. The transition to an oxygen dominant atmosphere (the Great Oxidation) did not begin until approximately 2.4-2.3 billion years ago, but photosynthetic processes started 0.3 to 1 billion years prior. The biology of life operates within a certain range of temperatures. Heat is a form of energy that regulates temperature. Heat affects growth rates, activity, behavior and primary production. Temperature is largely dependent on the incidence of solar radiation. The latitudinal and longitudinal spatial variation of temperature greatly affects climates and consequently the distribution of biodiversity and levels of primary production in different ecosystems or biomes across the planet. Heat and temperature relate importantly to metabolic activity. Poikilotherms, for example, have a body temperature that is largely regulated and dependent on the temperature of the external environment. In contrast, homeotherms regulate their internal body temperature by expending metabolic energy. There is a relationship between light, primary production, and ecological energy budgets. Sunlight is the primary input of energy into the planet's ecosystems. Light is composed of electromagnetic energy of different wavelengths. Radiant energy from the sun generates heat, provides photons of light measured as active energy in the chemical reactions of life, and also acts as a catalyst for genetic mutation. Plants, algae, and some bacteria absorb light and assimilate the energy through photosynthesis. Organisms capable of assimilating energy by photosynthesis or through inorganic fixation of H2S are autotrophs. Autotrophs—responsible for primary production—assimilate light energy that becomes metabolically stored as potential energy in the form of biochemical enthalpic bonds. The rate of diffusion of carbon dioxide and oxygen is approximately 10,000 times slower in water than it is in air. When soils become flooded, they quickly lose oxygen from low-concentration (hypoxic) to an (anoxic) environment where anaerobic bacteria thrive among the roots. Water also influences the spectral properties of light that becomes more diffuse as it is reflected off the water surface and submerged particles. Aquatic plants exhibit a wide variety of morphological and physiological adaptations that allow them to survive, compete and diversify these environments. For example, the roots and stems develop large cellular air spaces to allow for the efficient transportation gases (for example, CO2 and O2) used in respiration and photosynthesis. In drained soil, microorganisms use oxygen during respiration. In aquatic environments, anaerobic soil microorganisms use nitrate, manganic ions, ferric ions, sulfate, carbon dioxide and some organic compounds. The activity of soil microorganisms and the chemistry of the water reduces the oxidation-reduction potentials of the water. Carbon dioxide, for example, is reduced to methane (CH4) by methanogenic bacteria. Salt water also requires special physiological adaptations to deal with water loss. Salt water plants (or halophytes) are able to osmo-regulate their internal salt (NaCl) concentrations or develop special organs for shedding salt away. The physiology of fish is also specially adapted to deal with high levels of salt through osmoregulation. Their gills form electrochemical gradients that mediate salt excrusion in salt water and uptake in fresh water. The shape and energy of the land is affected to a large degree by gravitational forces. On a larger scale, the distribution of gravitational forces on the earth are uneven and influence the shape and movement of tectonic plates as well as having an influence on geomorphic processes such as orogeny and erosion. These forces govern many of the geophysical properties and distributions of ecological biomes across the Earth. On a organism scale, gravitational forces provide directional cues for plant and fungal growth (gravitropism), orientation cues for animal migrations, and influence the biomechanics and size of animals. Ecological traits, such as allocation of biomass in trees during growth are subject to mechanical failure as gravitational forces influence the position and structure of branches and leaves. The cardiovascular systems of all animals are functionally adapted to overcome pressure and gravitational forces that change according to the features of organisms (e.g., height, size, shape), their behavior (e.g., diving, running, flying), and the habitat occupied (e.g., water, hot deserts, cold tundra). Climatic and osmotic pressure places physiological constraints on organisms, such as flight and respiration at high altitudes, or diving to deep ocean depths. These constraints influence vertical limits of ecosystems in the biosphere as organisms are physiologically sensitive and adapted to atmospheric and osmotic water pressure differences. Oxygen levels, for example, decrease with increasing pressure and are a limiting factor for life at higher altitudes. Water transportation through trees is another important ecophysiological parameter dependent upon pressure. Water pressure in the depths of oceans requires adaptations to deal with the different living conditions. Mammals, such as whales, dolphins and seals are adapted to deal with changes in sound due to water pressure differences. The architecture of inflorescence in grasses is subject to the physical pressures of wind and shaped by the forces of natural selection facilitating wind-pollination (or anemophily). Turbulent forces in air and water have significant effects on the environment and ecosystem distribution, form and dynamics. On a planetary scale, ecosystems are affected by circulation patterns in the global trade winds. Wind power and the turbulent forces it creates can influence heat, nutrient, and biochemical profiles of ecosystems. For example, wind running over the surface of a lake creates turbulence, mixing the water column and influencing the environmental profile to create thermally layered zones, partially governing how fish, algae, and other parts of the aquatic ecology are structured. Wind speed and turbulence also exert influence on rates of evapotranspiration rates and energy budgets in plants and animals. Wind speed, temperature and moisture content can vary as winds travel across different landfeatures and elevations. The westerlies, for example, come into contact with the coastal and interior mountains of western North America to produce a rain shadow on the leeward side of the mountain. The air expands and moisture condenses as the winds move up in elevation which can cause precipitation; this is called orographic lift. This environmental process produces spatial divisions in biodiversity, as species adapted to wetter conditions are range-restricted to the coastal mountain valleys and unable to migrate across the xeric ecosystems of the Columbia Basin to intermix with sister lineages that are segregated to the interior mountain systems. Plants convert carbon dioxide into biomass and emit oxygen into the atmosphere. Approximately 350 million years ago (near the Devonian period) the photosynthetic process brought the concentration of atmospheric oxygen above 17%, which allowed combustion to occur. Fire releases CO2 and converts fuel into ash and tar. Fire is a significant ecological parameter that raises many issues pertaining to its control and suppression in management. While the issue of fire in relation to ecology and plants has been recognized for a long time, Charles Cooper brought attention to the issue of forest fires in relation to the ecology of forest fire suppression and management in the 1960s. Fire creates environmental mosaics and a patchiness to ecosystem age and canopy structure. Native North Americans were among the first to influence fire regimes by controlling their spread near their homes or by lighting fires to stimulate the production of herbaceous foods and basketry materials. The altered state of soil nutrient supply and cleared canopy structure also opens new ecological niches for seedling establishment. Most ecosystem are adapted to natural fire cycles. Plants, for example, are equipped with a variety of adaptations to deal with forest fires. Some species (e.g., Pinus halepensis) cannot germinate until after their seeds have lived through a fire. This environmental trigger for seedlings is called serotiny. Some compounds from smoke also promote seed germination. Ecologists study and measure nutrient budgets to understand how these materials are regulated and flow through the environment. This research has led to an understanding that there is a global feedback between ecosystems and the physical parameters of this planet including minerals, soil, pH, ions, water and atmospheric gases. There are six major elements, including H (hydrogen), C (carbon), N (nitrogen), O (oxygen), S (sulfur), and P (phosphorus) that form the constitution of all biological macromolecules and feed into the Earth's geochemical processes. From the smallest scale of biology the combined effect of billions upon billions of ecological processes amplify and ultimately regulate the biogeochemical cycles of the Earth. Understanding the relations and cycles mediated between these elements and their ecological pathways has significant bearing toward understanding global biogeochemistry. The ecology of global carbon budgets gives one example of the linkage between biodiversity and biogeochemistry. For starters, the Earth's oceans are estimated to hold 40,000 gigatonnes (Gt) carbon, vegetation and soil is estimated to hold 2070 Gt carbon, and fossil fuel emissions are estimated to emit an annual flux of 6.3 Gt carbon. At different times in the Earth's history there has been major restructuring in these global carbon budgets that was regulated to a large extent by the ecology of the land. For example, through the early-mid Eocene volcanic outgassing, the oxidation of methane stored in wetlands, and seafloor gases increased atmospheric CO2 concentrations to levels as high as 3500 ppm. In the Oligocene, from 25 to 32 million years ago, there was another significant restructuring in the global carbon cycle as grasses evolved a special type of C4 photosynthesis and expanded their ranges. This new photosynthetic pathway evolved in response to the drop in atmospheric CO2 concentrations below 550 ppm. Ecosystem functions such as these feed back significantly into global atmospheric models for carbon cycling. Loss in the abundance and distribution of biodiversity causes global carbon cycle feedbacks that are expected to increase rates of global warming in the next century. The effect of global warming melting large sections of permafrost creates a new mosaic of flooded areas where decomposition results in the emission of methane (CH4). Hence, there is a relationship between global warming, decomposition and respiration in soils and wetlands producing significant climate feedbacks and altered global biogeochemical cycles. There is concern over increases in atmospheric methane in the context of the global carbon cycle, because methane is also a greenhouse gas that is 23 times more effective at absorbing long-wave radiation on a 100 year time scale. Unlike many of the scientific disciplines, ecology has a complex and winding origin due in large part to its interdisciplinary nature. Several published books provide extensive coverage of the classics. In the early 20th century, ecology was an analytical form of natural history. The descriptive nature of natural history included examination of the interaction of organisms with both their environment and their community. Such examinations, conducted by important natural historians including James Hutton and Jean-Baptiste Lamarck, contributed to the development of ecology. The term "ecology" (German: Oekologie) is a more recent scientific development and was first coined by the German biologist Ernst Haeckel in his book Generelle Morphologie der Organismen (1866). By ecology we mean the body of knowledge concerning the economy of nature-the investigation of the total relations of the animal both to its inorganic and its organic environment; including, above all, its friendly and inimical relations with those animals and plants with which it comes directly or indirectly into contact-in a word, ecology is the study of all those complex interrelations referred to by Darwin as the conditions of the struggle of existence. Opinions differ on who was the founder of modern ecological theory. Some mark Haeckel's definition as the beginning, others say it was Eugen Warming with the writing of Oecology of Plants: An Introduction to the Study of Plant Communities (1895). Ecology may also be thought to have begun with Carl Linnaeus' research principals on the economy of nature that matured in the early 18th century. He founded an early branch of ecological study he called the economy of nature. The works of Linnaeus influenced Darwin in The Origin of Species where he adopted the usage of Linnaeus' phrase on the economy or polity of nature. Linnaeus made the first to attempt to define the balance of nature, which had previously been held as an assumption rather than formulated as a testable hypothesis. Haeckel, who admired Darwin's work, defined ecology in reference to the economy of nature which has led some to question if ecology is synonymous with Linnaeus' concepts for the economy of nature. Biogeographer Alexander von Humbolt was also foundational and was among the first to recognize ecological gradients and alluded to the modern ecological law of species to area relationships. The modern synthesis of ecology is a young science, which first attracted substantial formal attention at the end of the 19th century (around the same time as evolutionary studies) and become even more popular during the 1960s environmental movement. However, many observations, interpretations and discoveries relating to ecology extend back to much earlier studies in natural history. For example, the concept on the balance or regulation of nature can be traced back to Herodotos (died c. 425 BC) who described an early account of mutualism along the Nile river where crocodiles open their mouths to beneficially allow sandpipers safe access to remove leeches. In the broader contributions to the historical development of the ecological sciences, Aristotle is considered one of the earliest naturalists who had an influential role in the philosophical development of ecological sciences. One of Aristotle's students, Theophrastus, made astute ecological observations about plants and posited a philosophical stance about the autonomous relations between plants and their environment that is more in line with modern ecological thought. Both Aristotle and Theophrastus made extensive observations on plant and animal migrations, biogeography, physiology, and their habits in what might be considered an analog of the modern ecological niche. The layout of the first ecological experiment, noted by Charles Darwin in The Origin of Species, was studied in a grass garden at Woburn Abbey in 1817. The experiment studied the performance of different mixtures of species planted in different kinds of soils. From Aristotle to Darwin the natural world was predominantly considered static and unchanged since its original creation. Prior to The Origin of Species there was little appreciation or understanding of the dynamic and reciprocal relations between organisms, their adaptations and their modifications to the environment. While Charles Darwin is most notable for his treatise on evolution, he is also one of the founders of soil ecology. In The Origin of Species Darwin also made note of the first ecological experiment that was published in 1816. In the science leading up to Darwin the notion of evolving species was gaining popular support. This scientific paradigm changed the way that researchers approached the ecological sciences. Nowhere can one see more clearly illustrated what may be called the sensibility of such an organic complex,--expressed by the fact that whatever affects any species belonging to it, must speedily have its influence of some sort upon the whole assemblage. He will thus be made to see the impossibility of studying any form completely, out of relation to the other forms,--the necessity for taking a comprehensive survey of the whole as a condition to a satisfactory understanding of any part. The first American ecology book was published in 1905 by Frederic Clements. In his book, Clements forwarded the idea of plant communities as a superorganism. This publication launched a debate between ecological holism and individualism that lasted until the 1970s. The Clements superorganism concept proposed that ecosystems progress through regular and determined stages of seral development that are analogous to developmental stages of an organism whose parts function to maintain the integrity of the whole. The Clementsian paradigm was challenged by Henry Gleason. According to Gleason, ecological communities develop from the unique and coincidental association of individual organisms. This perceptual shift placed the focus back onto the life histories of individual organisms and how this relates to the development of community associations. The Clementsian superorganism concept has not been completely rejected, but it was an overextended application of holism, which remains a significant theme in contemporary ecological studies. Holism was first introduced in 1926 by a polarizing historical figure, a South African General named Jan Christian Smuts. Smuts was inspired by Clement's superorganism theory when he developed and published on the unifying concept of holism, which runs in stark contrast to his racial views as the father of apartheid. Around the same time, Charles Elton pioneered the concept of food chains in his classical book "Animal Ecology". Elton defined ecological relations using concepts of food-chains, food-cycles, food-size, and described numerical relations among different functional groups and their relative abundance. Elton's term 'food-cycle' was replaced by 'food-web' in a subsequent ecological text. Elton's book broke conceptual ground by illustrating complex ecological relations through simpler food-web diagrams. The number of authors publishing on the topic of ecology has grown considerably since the turn of 20th century. The explosion of information available to the modern researcher of ecology makes it an impossible task for one individual to sift through the entire history. Hence, the identification of classics in the history of ecology is a difficult designation to make. Ecology has developers in many nations, including Russia's Vladimir Vernadsky and his founding of the biosphere concept in the 1920s or Japan's Kinji Imanishi and his concepts of harmony in nature and habitat segregation in the 1950s. The scientific recognition or importance of contributions to ecology from other cultures is hampered by language and translation barriers. The history of ecology remains an active area of study, often published in the Journal of the History of Biology. The ecosystems of planet Earth are coupled to human environments. Ecosystems regulate the global geophysical cycles of energy, climate, soil nutrients, and water that in turn support and grow natural capital (including the environmental, physiological, cognitive, cultural, and spiritual dimensions of life). Ultimately, every manufactured product in human environments comes from natural systems. Ecosystems are considered common-pool resources because ecosystems do not exclude beneficiaries and they can be depleted or degraded. For example, green space within communities provides common-pool health services. Research shows that people who are more engaged with regular access to natural areas have lower rates of diabetes, heart disease and psychological disorders. These ecological health services are regularly depleted through urban development projects that do not factor in the common-pool value of ecosystems. The ecological commons delivers a diverse supply of community services that sustains the well-being of human society. The Millennium Ecosystem Assessment, an international UN initiative involving more than 1,360 experts worldwide, identifies four main ecosystem service types having 30 sub-categories stemming from natural capital. The ecological commons includes provisioning (e.g., food, raw materials, medicine, water supplies), regulating (e.g., climate, water, soil retention, flood retention), cultural (e.g., science and education, artistic, spiritual), and supporting (e.g., soil formation, nutrient cycling, water cycling) services. Ecological economics is an economic science that uses many of the same terms and methods that are used in accounting. Natural capital is the stock of materials or information stored in biodiversity that generates services that can enhance the welfare of communities. Population losses are the more sensitive indicator of natural capital than are species extinction in the accounting of ecosystem services. The prospect for recovery in the economic crisis of nature is grim. Populations, such as local ponds and patches of forest are being cleared away and lost at rates that exceed species extinctions. The WWF 2008 living planet report and other researchers report that human civilization has exceeded the bio-regenerative capacity of the planet. This means that human consumption is extracting more natural resources than can be replenished by ecosystems around the world. In 1992, professor William Rees developed the concept of our ecological footprint. The ecological footprint is a way of accounting the level of impact that human development is having on the Earth's ecosystems. All indications are that the human enterprise is unsustainable as the ecological footprint of society is placing too much stress on the ecology of the planet. The mainstream growth-based economic system adopted by governments worldwide does not include a price or markets for natural capital. This type of economic system places further ecological debt onto future generations. Human societies are increasingly being placed under stress as the ecological commons is diminished through an accounting system that has incorrectly assumed "... that nature is a fixed, indestructible capital asset. ":44 While nature is resilient and it does regenerate, there are limits to what can be extracted, but conventional monetary analyses are unable to detect the problem. Evidence of the limits in natural capital are found in the global assessments of biodiversity, which indicate that the current epoch, the Anthropocene is a sixth mass extinction. Species loss is accelerating at 100–1000 times faster than average background rates in the fossil record. The ecology of the planet has been radically transformed by human society and development causing massive loss of ecosystem services that otherwise deliver and freely sustain equitable benefits to human society through the ecological commons. The ecology of the planet is further threatened by global warming, but investments in nature conservation can provide a regulatory feedback to store and regulate carbon and other greenhouse gases. The field of conservation biology involves ecologists that are researching the nature of the biodiversity threat and searching for solutions to sustain the planet's ecosystems for future generations. In a global study we will initiate the process of analyzing the global economic benefit of biological diversity, the costs of the loss of biodiversity and the failure to take protective measures versus the costs of effective conservation. Ecologists are teaming up with economists to measure the wealth of ecosystems and to express their value as a way of finding solutions to the biodiversity crisis. Some researchers have attempted to place a dollar figure on ecosystem services, such as the value that the Canadian boreal forest is contributing to global ecosystem services. If ecologically intact, the boreal forest has an estimated value of US$3.7 trillion. The boreal forest ecosystem is one of the planet's great atmospheric regulators and it stores more carbon than any other biome on the planet. The annual value for ecological services of the Boreal Forest is estimated at US$93.2 billion, or 2.5 greater than the annual value of resource extraction. The economic value of 17 ecosystem services for the entire biosphere (calculated in 1997) has an estimated average value of US$33 trillion (1012) per year. These ecological economic values are not currently included in calculations of national income accounts, the GDP and they have no price attributes because they exist mostly outside of the global markets. The loss of natural capital continues to accelerate and goes undetected by mainstream monetary analysis. ELDIS, database ecological aspects of economical development. ^ a b c d Begon, M.; Townsend, C. R., Harper, J. L. (2006). Ecology: From individuals to ecosystems. (4th ed.). Blackwell. ISBN 1405111178. ^ a b c d e f g h i j k Allee, W.; Emerson, A. E., Park, O., Park, T., and Schmidt, K. P. (1949). Principles of Animal Ecology. W. B. Saunders Company. ISBN 0721611206. ^ a b c Smith, R.; Smith, R. M. (2000). Ecology and Field Biology. (6th ed.). Prentice Hall. ISBN 0321042905. ^ Huffaker, C. B., ed (1999). Ecological Entomology (2nd ed.). John Wiley and Sons. ISBN 9780471244837. http://books.google.com/books?id=aw5Iycas70cC. ^ Omerod, S.J. ; Pienkowski, M.W. ; Watkinson, A.R. (1999). "Communicating the value of ecology". Journal of Applied Ecology 36: 847–855. doi:10.1046/j.1365-2664.1999.00474.x. ^ Phillipson, J.; Lowe, P.; Bullock, J.M. (2009). "Navigating the social sciences: interdisciplinarity and ecology". Journal of Applied Ecology 46: 261–264. doi:10.1111/j.1365-2664.2009.01625.x. ^ Steward T. A. Pickett, Mary L. Cadenasso, J. Morgan Grove, Peter M. Groffman, Lawrence E. Band, Christopher G. Boone, William R. Burch Jr., C. Susan B. Grimmond, John Hom, Jennifer C. Jenkins, Neely L. Law, Charles H. Nilon, Richard V. Pouyat, Katalin Szlavecz, Paige S. Warren, Matthew A. Wilson, Steward T. A.; Cadenasso, Mary L.; Grove, J. Morgan; Groffman, Peter M.; Band, Lawrence E.; Boone, Christopher G.; Burch, William R.; Grimmond, C. Susan B. et al. (2008). "Beyond Urban Legends: An Emerging Framework of Urban Ecology, as Illustrated by the Baltimore Ecosystem Study". BioScience 58: 139–150. doi:10.1641/B580208. ^ Aguirre, A.A. (2009). "Biodiversity and Human Health". EcoHealth 6: 153. doi:10.1007/s10393-009-0242-0. ^ Levin, S. A. (1992). "The problem of pattern and scale in ecology: the Robert H. MacArthur Award". Ecology 73 (6): 1943–1967. doi:10.2307/1941447. http://biology.ucf.edu/~pascencio/classes/Spatial%20Ecology/Levin.pdf. Retrieved 2010-03-16. ^ Stadler, B.; Michalzik, B.; Müller, T. (1998). "Linking aphid ecology with nutrient fluxes in a coniferous forest". Ecology 79 (5): 1514–1525. doi:10.1890/0012-9658(1998)079[1514:LAEWNF]2.0.CO;2. ^ Humphreys, N. J.; Douglas, A. E. (1997). "Partitioning of symbiotic bacteria between generations of an insect: a quantitative study of a Buchnera sp. in the pea aphid (Acyrthosiphon pisum) reared at different temperatures". Applied and Environmental Microbiology 63 (8): 3294–3296. PMID 16535678. PMC 1389233. http://www.ncbi.nlm.nih.gov/pmc/articles/PMC1389233/pdf/hw3294.pdf. Retrieved 2010-03-16. ^ Pojar, J.; Klinka, K.; Meidinger, D. V. (1987). "Biogeoclimatic ecosystem classification in British Columbia". Forest Ecology and Management 22 (1–2): 119–154. doi:10.1016/0378-1127(87)90100-9. ^ Levin, S. A. (2000). "Multiple scales and the maintenance of biodiversity". Ecosystems 3 (6): 498–506. doi:10.1007/s100210000044. ^ Loehle, C. (2004). "Challenges of ecological complexity". Ecological complexity 1 (1): 3–6. doi:10.1016/j.ecocom.2003.09.001. ^ a b Holling, C. S. (2004). "Understanding the Complexity of Economic, Ecological, and Social Systems". Ecosystems 4 (5): 390–405. doi:10.1007/s10021-001-0101-5. ^ Schneider, D. D. (2001). "The Rise of the Concept of Scale in Ecology". BioScience 51 (7): 545–553. doi:10.1641/0006-3568(2001)051[0545:TROTCO]2.0.CO;2. http://www.mun.ca/biology/dschneider/Publications/2001DCS_AIBS_RiseOfScale.pdf. Retrieved 2010-03-16. ^ Molnar, J.; Marvier, M.; Kareiva, P. (2004). "The sum is greater than the parts". Conservation Biology 18 (6): 1670–1671. doi:10.1111/j.1523-1739.2004.00l07.x. http://www.environmental-expert.com/Files%5C8392%5Carticles%5C9961%5CTheSumIsGreaterthantheParts.pdf. ^ a b Odum, E. P. (1977). "The emergence of ecology as a new integrative discipline". Science 195 (4284): 1289–1293. doi:10.1126/science.195.4284.1289. PMID 17738398. ^ a b c d Lovelock, J. (2003). "The living Earth". Nature 426 (6968): 769–770. doi:10.1038/426769a. PMID 14685210. ^ "Welcome to ILTER — ILTER". International Long Term Ecological Research. http://www.ilternet.edu/. Retrieved 2010-03-16. ^ Silverton, J.; Poulton, P.; Johnston, E.; Grant, E.; Heard, M.; Biss, P. M. (2006). "The Park Grass Experiment 1856–2006: its contribution to ecology". Journal of Ecology 94 (4): 801–814. doi:10.1111/j.1365-2745.2006.01145.x. http://www.demonsineden.com/Site/Research_publications_files/Silvertown%20et%20al.%202006.pdf. ^ "Hubbard Brook Ecosystem Study Front Page". http://www.hubbardbrook.org/. Retrieved 2010-03-16. ^ Nachtomy, Ohad; Shavit, Ayelet; Smith, Justin (2002). "Leibnizian organisms, nested individuals, and units of selection". Theory in Biosciences 121 (2): 205. doi:10.1007/s12064-002-0020-9. ^ a b c Begon, M.; Townsend, C. R.; Harper, J. L. (2006). Ecology: from individuals to ecosystems (4th ed.). Oxford, UK: Blackwell Publishing. ISBN 978-1-4051-1117-1. http://books.google.com/?id=Lsf1lkYKoHEC&printsec=frontcover. ^ Zak, K. M.; Munson, B. H. (2008). "An exploratory study of elementary preservice teachers’ understanding of ecology using concept maps". The Journal of Environmental Education 39 (3): 32–46. doi:10.3200/JOEE.39.3.32-46. http://www.duluth.umn.edu/~kgilbert/ened5560-1/Readings/SciEd-JEESpring2008-ZakMunsonArticleUpdated.pdf. Retrieved 2010-03-16. ^ DeLong, D. C. (1996). "Defining Biodiversity". Wildlife Society Bulletin 24 (4): 738–749. http://www.jstor.org/pss/3783168. ^ a b Scholes, R. J.; Mace, G. M.; Turner, W.; Geller, G. N.; Jurgens, N.; Larigauderie, A.; et al., D; Walther, BA et al. (2008). "Toward a global biodiversity observing system". Science 321 (5892): 1044–1045. doi:10.1126/science.1162055. PMID 18719268. http://www.earthobservations.com/documents/committees/uic/200809_8thUIC/07b-Health0Montira-Pongsiri-BON-Article-in-Science.pdf. ^ a b c d e f Wilson, E. O. (2000). "A Global Biodiversity Map". Science 289 (5488): 2279. PMID 11041790. ^ Purvis, A.; Hector, A. (2000). "Getting the measure of biodiversity". Nature 405 (6783): 212–218. doi:10.1038/35012221. PMID 10821281. http://www.botanischergarten.ch/BiodivVorles-2005WS/Nature-Insight-Biodiversity-2000.pdf. Retrieved 2010-03-16. ^ Ostfeld, R. S. (2009). "Biodiversity loss and the rise of zoonotic pathogens". Clinical Microbiology and Infection 15 (s1): 40–43. doi:10.1111/j.1469-0691.2008.02691.x. PMID 19220353. http://www.ecostudies.org/reprints/Ostfeld_2009_Clin_Microbiol_Inf.pdf. ^ Tierney, G. L.; Faber-Langendoen, D.; Mitchell, B. R.; Shriver, W. G.; Gibbs, J. P. (2009). "Monitoring and evaluating the ecological integrity of forest ecosystems". Frontiers in Ecology and the Environment 7 (6): 308–316. doi:10.1890/070176. http://www.uvm.edu/~bmitchel/Publications/Tierney_Forest_monitoring.pdf. Retrieved 2010-03-16. ^ Wilcove, D. S.; Wikelski, M. (2008). "Going, going, gone: is animal migration disappearing". PLoS Biol 6 (7): e188. doi:10.1371/journal.pbio.0060188. PMID 18666834. ^ a b Svenning, Jens-Christian; Condi, R. (2008). "Biodiversity in a warmer world". Science 322 (5899): 206–207. doi:10.1126/science.1164542. PMID 18845738. ^ a b Ceballos, G.; Ehrlich, P. R. (2002). "Mammal Population Losses and the Extinction Crisis". Science 296 (5569): 904–907. doi:10.1126/science.1069349. PMID 11988573. http://epswww.unm.edu/facstaff/gmeyer/envsc330/CeballosEhrlichmammalextinct2002.pdf. Retrieved 2010-03-16. ^ Palumbi, S. R.; Sandifer, P. A.; Allan, J. D.; Beck, M. W.; Fautin, D. G.; Fogarty, M. J.; et al., Benjamin S; Incze, Lewis S et al. (2009). "Managing for ocean biodiversity to sustain marine ecosystem services". Frontiers in Ecology and the Environment 7 (4): 204–211. doi:10.1890/070135. http://research.usm.maine.edu/gulfofmaine-census/wp-content/docs/Palumbi-et-al-2009_Managing-for-ocean-biodiversity.pdf. ^ Hammond, H. (2009). Maintaining whole systems on the Earth's crown: Ecosystem-based conservation planning for the Boreal forest. Slocan Park, BC: Silva Forest Foundation. p. 380. ISBN 978-0-9734779-0-0. http://www.silvafor.org/crown. ^ a b c Laland, K. N.; Odling-Smee, F.J.; Feldman, M.W. (1999). "Evolutionary consequences of niche construction and their implications for ecology". PNAS 96 (18): 10242–10247. doi:10.1073/pnas.96.18.10242. PMID 10468593. ^ a b Hughes, D. P.; Pierce, N. E.; Boomsma, J. J. (2008). "Social insect symbionts: evolution in homeostatic fortresses". Trends in Ecology & Evolution 23 (12): 672–677. doi:10.1016/j.tree.2008.07.011. PMID 18951653. http://www.csub.edu/~psmith3/Teaching/discussion3C.pdf. ^ a b c Wiens, J. J.; Graham, C. H. (2005). "Niche Conservatism: Integrating Evolution, Ecology, and Conservation Biology". Annual Review of Ecology, Evolution, and Systematics 36: 519–539. doi:10.1146/annurev.ecolsys.36.102803.095431. http://life.bio.sunysb.edu/ee/grahamlab/pdf/Wiens_Graham_AnnRev2005.pdf. ^ Hutchinson, G. E. (1957). A Treatise on Limnology.. New York: Wiley & Sons.. p. 1015. ISBN 0471425729. ^ a b Hutchinson, G. E. (1957). "Concluding remarks.". Cold Spring Harb Symp Quant Biol 22: 415–427. http://symposium.cshlp.org/content/22/415.full.pdf+html. ^ Whittaker, R. H.; Levin, S. A.; Root, R. B. (1973). "Niche, Habitat, and Ecotope". The American Naturalist 107 (955): 321–338. doi:10.1086/282837. http://www.jstor.org/stable/2459534?seq=6. ^ Beyer, H. L.; Haydon, D. T.; Morales, J. M.; Frair, J. L.; Hebblewhite, H.; et al., M; Matthiopoulos, J (2010). "The interpretation of habitat preference metrics under use–availability designs". Phil. Trans. R. Soc. B 365 (1550): 2245–2254. doi:10.1098/rstb.2010.0083. PMID 20566501. ^ Pearman, P. B.; Guisan, A.; Broennimann, O.; Randin, C. F. (2008). "Niche dynamics in space and time". Trends in Ecology & Evolution 23 (3): 149–158. doi:10.1016/j.tree.2007.11.005. PMID 18289716. http://connected.uwc.ac.za/blog/upload/SABIF_niche_modelling/Literature/Range_limiting_factors/GeneralTheory/Pearman%20et%20al%202008%20Niche%20dynamics%20in%20space%20and%20time.pdf. ^ McGill, B. J.; Enquist, B. J.; Weiher, E.; Westoby, M. (2006). "Rebuilding community ecology from functional traits". Trends in Ecology and Evolution 21 (4): 178–185. doi:10.1016/j.tree.2006.02.002. PMID 16701083. ^ Hardin, G. (1960). "The competitive exclusion principal.". Science 131 (3409): 1292–1297. doi:10.1126/science.131.3409.1292. ^ Kiessling, W.; Simpson, C.; Foote, M. (2009). "Reefs as Cradles of Evolution and Sources of Biodiversity in the Phanerozoic.". Science 327 (5962): 196–198. doi:10.1126/science.1182241. PMID 20056888. ^ Hastings, A. B.; Crooks, J. E.; Cuddington, J. A.; Jones, K.; Lambrinos, C. J.; Talley, J. G.; et al., TS; Wilson, WG (2007). "Ecosystem engineering in space and time". Ecology Letters 10 (2): 153–164. doi:10.1111/j.1461-0248.2006.00997.x. PMID 17257103. ^ Jones, Clive G.; Lawton, John H.; Shachak, Moshe (1994). "Organisms as ecosystem engineers". Oikos 69 (3): 373–386. doi:10.2307/3545850. http://jstor.org/stable/3545850. ^ Wfirst1=J.P., Justin P.; Jones, C.G. (2006). "The Concept of Organisms as Ecosystem Engineers Ten Years On: Progress, Limitations, and Challenges". BioScience 56: 203–209. doi:10.1641/0006-3568(2006)056[0203:TCOOAE]2.0.CO;2. ^ Day, R. L.; Laland, K. N.; Odling-Smee, J. (2003). "Rethinking Adaptation: the niche-construction perspective". Perspectives in Biology and Medicine 46 (1): 80–95. doi:10.1353/pbm.2003.0003. PMID 12582272. https://apps.lis.illinois.edu/wiki/download/attachments/10981360/day_odling-smee-niche_construction.pdf. ^ Boogert, N. J.; Paterson, D. M.; Laland, K. N. (2006). "The Implications of Niche Construction and Ecosystem Engineering for Conservation Biology". BioScience 56 (7): 570–578. doi:10.1641/0006-3568(2006)56[570:TIONCA]2.0.CO;2. http://lalandlab.st-andrews.ac.uk/pdf/BoogertetalBioscience.pdf. ^ Waples, R. S.; Gaggiotti, O. (2006). "What is a population? An empirical evaluation of some genetic methods for identifying the number of gene pools and their degree of connectivity." Molecular Ecology 15 (6): 1419–1439. doi:10.1111/j.1365-294X.2006.02890.x. PMID 16629801. http://folk.uio.no/gillesg/ConGen/biblio/TheoMeth/WaplesGaggiotti_2006.pdf. ^ a b c Turchin, P. (2001). "Does Population Ecology Have General Laws?". Oikos 94 (1): 17–26. doi:10.1034/j.1600-0706.2001.11310.x. ^ Johnson, J. B.; Omland, K. S. (2004). "Model selection in ecology and evolution.". Trends in Ecology and Evolution 19 (2): 101–108. doi:10.1016/j.tree.2003.10.013. PMID 16701236. http://www.usm.maine.edu/bio/courses/bio621/model_selection.pdf. ^ Berryman, A. A. (1992). "The Origins and Evolution of Predator-Prey Theory". Ecology 73 (5): 1530–1535. doi:10.2307/1940005. http://jstor.org/stable/1940005. ^ Terms and definitions directly quoted from: Wells, J. V.; Richmond, M. E. (1995). "Populations, metapopulations, and species populations: What are they and who should care?". Wildlife Society Bulletin 23 (3): 458–462. http://www.uoguelph.ca/zoology/courses/BIOL3130/wells11.pdf. ^ Levins, R. (1969). "Some demographic and genetic consequences of environmental heterogeneity for biological control.". Bulletin of the Entomological Society of America 15: 237–240. ISBN 9780231126809. http://books.google.com/?id=8jfmor8wVG4C&pg=PA162. ^ Levins, R. (1970). Gerstenhaber, M.. ed. Extinction. In: Some Mathematical Questions in Biology. pp. 77–107. ISBN 9780821811528. http://books.google.com/?id=CfZHU1aZqJsC&dq=Some+Mathematical+Questions+in+Biology&printsec=frontcover. ^ Smith, M. A.; Green, D. M. (2005). "Dispersal and the metapopulation paradigm in amphibian ecology and conservation: are all amphibian populations metapopulations?". Ecography 28 (1): 110–128. doi:10.1111/j.0906-7590.2005.04042.x. ^ Hanski, I. (1998). "Metapopulation dynamics". Nature 396: 41–49. doi:10.1038/23876. http://www.helsinki.fi/~ihanski/Articles/Nature%201998%20Hanski.pdf. ^ Petranka, J. W. (2007). "Evolution of complex life cycles of amphibians: bridging the gap between metapopulation dynamics and life history evolution". Evolutionary Ecology 21 (6): 751–764. doi:10.1007/s10682-006-9149-1. ^ Hanski, I.; Gaggiotti, O. E., eds (2004). Ecology, genetics and evolution of metapopulations.. Burlington, MA: Elsevier Academic Press. ISBN 0-12-323448-4. http://books.google.com/?id=EP8TAQAAIAAJ&q=ecology,+genetics,+and+evolution+of+metapopulations&dq=ecology,+genetics,+and+evolution+of+metapopulations&cd=1. ^ MacKenzie, D. I.; Nichols, J. D.; Royle, J. A.; Pollock, K. H.; Bailey, L. L.; Hines, J. E. (2006). Occupancy Estimation and Modeling: Inferring patterns and dynamics of species occurrence.. London, UK: Elsevier Academic Press. p. 324. ISBN 978-0-12-088766-8. http://books.google.com/?id=RaCmF9PioCIC&printsec=frontcover. ^ a b Tansley, A. G. (1935). "The Use and Abuse of Vegetational Concepts and Terms.". Ecology 16 (3): 284–307. doi:10.2307/1930070. http://karljaspers.org/files/tansley.pdf. ^ Levin, S. A. (1998). [http://citeseerx.ist.psu.edu/viewdoc/download?doi=10.1.1.83.6318&rep=rep1&type=pdf "Ecosystems and the Biosphere as Complex Adaptive Systems"]. Ecosystems 1: 431–436. doi:10.1007/s100219900037. http://citeseerx.ist.psu.edu/viewdoc/download?doi=10.1.1.83.6318&rep=rep1&type=pdf. ^ Johnson, M. T.; Strinchcombe, J. R. (2007). "An emerging synthesis between community ecology and evolutionary biology.". Trends in Ecology and Evolution 22 (5): 250–257. doi:10.1016/j.tree.2007.01.014. PMID 17296244. ^ Brinson, M. M.; Lugo, A. E.; Brown, S (1981). "Primary Productivity, Decomposition and Consumer Activity in Freshwater Wetlands". Annual Review of Ecology and Systematics 12: 123–161. doi:10.1146/annurev.es.12.110181.001011. ^ a b Davic, R. D.; Welsh, H. H. (2004). "On the Ecological Role of Salamanders". Annual Review of Ecology and Systematics 35: 405–434. doi:10.1146/annurev.ecolsys.35.112202.130116. ^ Paine, R. T. (1980). "Food Webs: Linkage, Interaction Strength and Community Infrastructure". Journal of Animal Ecology 49 (3): 667–685. http://www.jstor.org/stable/4220. ^ Abrams, P. A. (1993). "Effect of Increased Productivity on the Abundances of Trophic Levels". The American Naturalist 141 (3): 351–371. doi:10.1086/285478. http://www.jstor.org/stable/2462676?seq=1. ^ a b c d Egerton, Frank N. (2007). "Understanding Food Chains and Food Webs, 1700–1970". Bulletin of the Ecological Society of America 88: 50–69. doi:10.1890/0012-9623(2007)88[50:UFCAFW]2.0.CO;2. ^ Shurin, J. B.; Gruner, D. S.; Hillebrand, H. (2006). "All wet or dried up? Real differences between aquatic and terrestrial food webs.". Proc. R. Soc. B 273 (1582): 1–9. doi:10.1098/rspb.2005.3377. PMID 16519227. ^ Edwards, J.; Fraser, K. (1983). "Concept maps as reflectors of conceptual understanding.". Research in science education 13: 19–26. doi:10.1007/BF02356689. ^ a b Pimm, S. L.; Lawton, J. H.; Cohen, J. E. (1991). "Food web patterns and their consequences". Nature 350: 669–674. doi:10.1038/350669a0. http://www.nicholas.duke.edu/people/faculty/pimm/publications/pimmreprints/71_Pimm_Lawton_Cohen_Nature.pdf. ^ Elser, J.; Hayakawa, K.; Urabe, J. (2001). "Nutrient Limitation Reduces Food Quality for Zooplankton: Daphnia Response to Seston Phosphorus Enrichment.". Ecology 82 (3): 898–903. doi:10.1890/0012-9658(2001)082[0898:NLRFQF]2.0.CO;2. ^ a b c Worm, B.; Duffy, J.E. (2003). "Biodiversity, productivity and stability in real food webs". Trends in Ecology and Evolution 18 (12): 628–632. doi:10.1016/j.tree.2003.09.003. ^ Wilbur, H. W. (1997). "Experimental Ecology of Food Webs: Complex Systems in Temporary Ponds". Ecology 78 (8): 2279–2302. doi:10.1890/0012-9658(1997)078[2279:EEOFWC]2.0.CO;2. ^ a b Post, D. M. (1993). "The long and short of food-chain length". Trends in Ecology and Evolution 17 (6): 269–277. doi:10.1016/S0169-5347(02)02455-2. ^ Duffy, J. E.; Cardinale, B. J.; France, K. E.; McIntyre, P. B.; Thébault, E.; Loreau, M. (2007). "The functional role of biodiversity in ecosystems: incorporating trophic complexity.". Ecology Letters 10 (6): 522–538. doi:10.1111/j.1461-0248.2007.01037.x. PMID 17498151. ^ a b c Elton, C. S. (1927). Animal Ecology. London, UK. : Sidgwick and Jackson. ISBN 0226206394. ^ Davic, R. D. (2003). "Linking keystone species and functional groups: a new operational definition of the keystone species concept.". Conservation Ecology 7 (1): r11. http://www.consecol.org/vol7/iss1/resp11/. ^ a b Oksanen, L. (1991). "Trophic levels and trophic dynamics: A consensus emerging?". Trends in Ecology and Evolution 6 (2): 58–60. doi:10.1016/0169-5347(91)90124-G.
^ Proulx, Stephen R.; Promislow, Daniel E.L.; Phillips, Patrick C. (2005). "Network thinking in ecology and evolution". Trends in Ecology and Evolution 20 (6): 345–353. doi:10.1016/j.tree.2005.04.004. PMID 16701391. ^ Raffaelli, D. (2002). "From Elton to Mathematics and Back Again". Science 296 (5570): 1035–1037. doi:10.1126/science.1072080. PMID 12004106. ^ a b c d e f Rickleffs, Robert, E. (1996). The Economy of Nature. University of Chicago Press. p. 678. ISBN 0716738473. ^ Whitman, W. B.; Coleman, D. C.; Wieb, W. J. (1998). "Prokaryotes: The unseen majority". Proc. Natl. Acad. Sci. USA 95 (12): 6578–6583. doi:10.1073/pnas.95.12.6578. PMID 9618454. ^ Groombridge, B.; Jenkins, M. (2002). World atlas of biodiversity: earth's living resources in the 21st century. World Conservation Monitoring Centre, United Nations Environment Programme. ISBN 0-520-23688-8. http://books.google.com/?id=_kHeAXV5-XwC&printsec=frontcover. ^ Lecerf, A.; Dobson, M.; Dang, C. K.; Chauvet, E (2005). "Riparian plant species loss alters trophic dynamics in detritus-based stream ecosystems". Oecologia 146 (3): 432–442. doi:10.1007/s00442-005-0212-3. PMID 16096846. http://www.ecolab.ups-tlse.fr/rivfunction/download/Lecerf%20et%20al%202005.pdf. ^ a b Wilkinson, M. T.; Richards, P. J.; Humphreys, G. S. (2009). "Breaking ground: Pedological, geological, and ecological implications of soil bioturbation.". Earth-Science Reviews 97 (1-4): 257–272. doi:10.1016/j.earscirev.2009.09.005. http://128.163.2.27/AS/Geography/People/Faculty/Wilkinson/Wilkinson.ESR.pdf. ^ Hasiotis, S. T. (2003). "Complex ichnofossils of solitary and social soil organisms: understanding their evolution and roles in terrestrial paleoecosystems.". Palaeogeography, Palaeoclimatology, Palaeoecology 192 (2): 259–320. doi:10.1016/S0031-0182(02)00689-2. ^ Loehle, C.; Pechmann, Joseph H. K. (1988). "Evolution: The Missing Ingredient in Systems Ecology". The American Naturalist 132 (9): 884–899. doi:10.1086/284895. http://www.jstor.org/stable/2462267. ^ Ulanowicz, R. E.; Kemp, W. Michael (1979). "Toward Canonical Trophic Aggregations". The American Naturalist 114 (6): 871–883. doi:10.1086/283534. http://www.jstor.org/stable/2460557. ^ Li, B. (2000). "Why is the holistic approach becoming so important in landscape ecology?". Landscape and Urban Planning 50 (1-3): 27–41. doi:10.1016/S0169-2046(00)00078-5. ^ a b Polis, G.A. ; Sears, A.L.W. ; Huxel, G.R. ; Strong, D.R. ; Maron, J. (2000). "When is a trophic cascade a trophic cascade?". Trends in Ecology and Evolution 15 (11): 473–475. doi:10.1016/S0169-5347(00)01971-6. PMID 11050351. http://www.cof.orst.edu/leopold/class-reading/Polis%202000.pdf. ^ Fischer, J.; Lindenmayer, D. B.; Manning, A. D. (2006). "Biodiversity, ecosystem function, and resilience: ten guiding principles for commodity production landscapes.". Frontiers in Ecology and the Environment 4 (2): 80–86. doi:10.1890/1540-9295(2006)004[0080:BEFART]2.0.CO;2. http://www.tecniflora.com.br/1_-_Guidelines_commodity_production.pdf. ^ Libralato, S.; Christensen, V.; Pauly, D. (2006). "A method for identifying keystone species in food web models.". Ecological Modelling 195 (3-4): 153–171. doi:10.1016/j.ecolmodel.2005.11.029. http://www.fisheries.ubc.ca/archive/members/dpauly/journalArticles/2005/MethodIdentifyKeystoneSpeciesFoodWebModels.pdf. ^ a b Mills, L.S. ; Soule, M.E. ; Doak, D.F. (1993). "The Keystone-Species Concept in Ecology and Conservation". BioScience 43 (4): 219–224. doi:10.2307/1312122. http://jstor.org/stable/1312122. ^ Anderson, P.K. (1995). "Competition, predation, and the evolution and extinction of Stellar's sea cow, Hydrodamalis gigas". Marine Mammal Science 11 (3): 391–394. doi:10.1111/j.1748-7692.1995.tb00294.x. ^ Palmer, M.; White, P. S. (1994). "On the existence of ecological communities". Journal of Vegetation Sciences 5 (2): 279–282. doi:10.2307/3236162. http://www.bio.unc.edu/faculty/White/Reprints/Palmer_White_JVS_5_2_818340.pdf. ^ Prentice, I. C.; Cramer, W.; Harrison, S. P.; Leemans, R.; Monserud, R. A.; Solomon, A. M. (1992). "Special Paper: A Global Biome Model Based on Plant Physiology and Dominance, Soil Properties and Climate". Journal of Biogeography 19 (2): 117–134. doi:10.2307/2845499. http://www.jstor.org/pss/2845499. ^ Turnbaugh, P. J.; Ley, R. E.; Hamady, M.; Fraser-Liggett, C. M.; Knight, R.; Gordon, J. I. (2007). "The Human Microbiome Project". Nature 449 (7164): 804–810. doi:10.1038/nature06244. PMID 17943116. http://web.mac.com/redifiori/Russell_Di_Fiori/Prokaryotes_files/human%20microbiome%20project.pdf. ^ DeLong, E. F. (2009). "The microbial ocean from genomes to biomes.". Nature 459 (7244): 200–206. doi:10.1038/nature08059. PMID 19444206. http://researchpages.net/media/resources/2009/07/30/nature08059.pdf. ^ Igamberdiev, Abir U.; Lea, P. J. (2006). "Land plants equilibrate O2 and CO2 concentrations in the atmosphere.". Photosynthesis Research 87 (2): 177–194. doi:10.1007/s11120-005-8388-2. PMID 16432665. http://www.mun.ca/biology/igamberdiev/PhotosRes_CO2review.pdf. ^ Lovelock, J.; Margulis, Lynn (1973). "Atmospheric homeostasis by and for the biosphere: the Gaia hypothesis." ([dead link]). Tellus 26: 2–10. doi:10.1111/j.2153-3490.1974.tb01946.x. http://people.uncw.edu/borretts/courses/BIO60209/Lovelock%20Margulis%201974%20atmospheric%20homeostasis%20by%20and%20for%20the%20biosphere%20-%20the%20gaia%20hypothesis.pdf. ^ Miles, D. B.; Dunham, A. E. (1993). "Historical Perspectives in Ecology and Evolutionary Biology: The Use of Phylogenetic Comparative Analyses". Annual Review of Ecology and Systematics 24: 587–619. doi:10.1146/annurev.es.24.110193.003103. ^ Vrba, E. S.; Eldredge, N. (1984). "Individuals, Hierarchies and Processes: Towards a More Complete Evolutionary Theory". Paleobiology 10 (2): 146–171. http://www.jstor.org/stable/2400395. ^ Gould, S.J. ; Lloyd, E.A. (1999). "Individuality and adaptation across levels of selection: How shall we name and generalize the unit of Darwinism?". Proceedings of the National Academy of Science 96 (21): 11904–11909. doi:10.1073/pnas.96.21.11904. ^ Stuart-Fox, D.; Moussalli, A. (2008). "Selection for Social Signalling Drives the Evolution of Chameleon Colour Change.". PLoS Biol 6 (1): e25. doi:10.1371/journal.pbio.0060025. PMID 18232740. ^ Karban, R. (2008). "Plant behaviour and communication". Ecology Letters 11 (7): 727–739. doi:10.1111/j.1461-0248.2008.01183.x. PMID 18400016. ^ Tinbergen, N. (1963). "On aims and methods of ethology". Zeitschrift für Tierpsychologie 20: 410–433. http://www.esf.edu/EFB/faculty/documents/Tinbergen1963onethology.pdf. ^ Hamner, W. M. (1985). "The importance of ethology for investigations of marine zooplankton". Bulletin of Marine Science 37 (2): 414–424. http://www.ingentaconnect.com/content/umrsmas/bullmar/1985/00000037/00000002/art00005. ^ a b Strassmann, J. E.; Zhu, Y; Queller, DC (2000). "Altruism and social cheating in the social amoeba Dictyostelium discoideum". Nature 408 (6815): 965–967. doi:10.1038/35050087. PMID 11140681. ^ Sakurai, K. (1985). "An attelabid weevil (Euops splendida) cultivates fungi". Journal of Ethology 3 (2): 151–156. doi:10.1007/BF02350306. ^ Anderson, J. D. (1961). "The courtship behaviour of Ambystoma macrodactylum croceum.". Copeia 2 (2): 132–139. http://www.jstor.org/pss/1439987. ^ Gould, Stephen, J.; Vrba, Elizabeth, S. (1982). "Exaptation-a missing term in the science of form.". Paleobiology 8 (1): 4–15. ^ Ives, A. R.; Cardinale, B. J.; Snyder, W. E. (2004). "A synthesis of subdisciplines: predator–prey interactions, and biodiversity and ecosystem functioning". Ecology Letters 8 (1): 102–116. doi:10.1111/j.1461-0248.2004.00698.x. http://www.lifesci.ucsb.edu/eemb/labs/cardinale/pdfs/ives_ecol_lett_2005.pdf. ^ Krebs, J. R.; Davies, N. B. (1993). An Introduction to Behavioural Ecology. Wiley-Blackwell. p. 432. ISBN 978-0632035465. http://books.google.com/?id=CA31asx7zq4C&printsec=frontcover. ^ Webb, J. K.; Pike, D. A.; Shine, R. (2010). "Olfactory recognition of predators by nocturnal lizards: safety outweighs thermal benefits". Behavioural Ecology 21 (1): 72–77. doi:10.1093/beheco/arp152. ^ Cooper, W. E.; Frederick, W. G. (2010). "Predator lethality, optimal escape behavior, and autotomy". Behavioral Ecology 21 (1): 91–96. doi:10.1093/beheco/arp151. http://library.unbc.ca:3000/cgi/content/abstract/21/1/91. ^ Fukomoto J. (1995). Long-toed salamander (Ambystoma macrodactylum) ecology and management in Waterton Lakes National Park. The University of Calgary, Thesis or Dissertation, M.E.Des. ^ Toledo, R (1995). "Cutaneous granular glands and amphibian venoms". Comparative Biochemistry and Physiology Part A: Physiology 111: 1. doi:10.1016/0300-9629(95)98515-I. ^ Williams, Thomas A.; Larsen, John H. (1986). "New function for the granular skin glands of the eastern long-toed salamander,Ambystoma macrodactylum columbianum". Journal of Experimental Zoology 239: 329. doi:10.1002/jez.1402390304. ^ Grant JB, Evans JA. (2007). A technique to collect and assay adhesive-free skin secretions from Ambystomatid salamanders. Herpetological Review 38(3):301–305. ^ Eastwood, R. (2004). "Successive replacement of tending ant species at aggregations of scale insects (Hemiptera: Margarodidae and Eriococcidae) on Eucalyptus in south-east Queensland.". Australian Journal of Entomology 43: 1–4. doi:10.1111/j.1440-6055.2003.00371.x. http://www.oeb.harvard.edu/faculty/pierce/people/eastwood/resources/pdfs/Scale-ant2004.pdf. ^ Page, R. d. m. (1991). "Clocks, Clades, and Cospeciation: Comparing Rates of Evolution and Timing of Cospeciation Events in Host-Parasite Assemblages". Systematic Zoology 40 (2): 188–198. doi:10.2307/2992256. http://www.jstor.org/pss/2992256. ^ Kiers, E. T.; van der Heijden, M. G. A. (2006). "Mutualistic stability in the arbuscular mycorrhizal symbiosis: Exploring hypotheses of evolutionary cooperation.". Ecology 87 (7): 1627–1636. doi:10.1890/0012-9658(2006)87[1627:MSITAM]2.0.CO;2. PMID 16922314. http://people.umass.edu/lsadler/adlersite/kiers/Kiers_Ecology_2006.pdf. ^ Aanena, D. K.; Hoekstra, R. F. (2007). "The evolution of obligate mutualism: if you can’t beat ’em, join ’em". Trends in Ecology & Evolution 22 (10): 506–509. doi:10.1016/j.tree.2007.08.007. PMID 17825952. http://www.izb.unibe.ch/student/Lehrveranstaltungen/pdf/07_hopa/Aanen%2007.pdf. ^ Boucher, D. H.; James, S.; Keeler, K. H. (1982). "The Ecology of Mutualism". Annual Review of Ecology and Systematics 13: 315–347. doi:10.1146/annurev.es.13.110182.001531. ^ Herre, E. A.; Knowlton, N.; Mueller, U. G.; Rehner, S. A. (1999). "The evolution of mutualisms: Exploring the paths between conflict and cooperation.". Trends in Ecology and Evolution 14 (2): 49–53. doi:10.1016/S0169-5347(98)01529-8. PMID 10234251. http://www.biology.lsu.edu/webfac/kharms/HerreEA_etal_1999_TREE.pdf. ^ Gilbert, F. S. (1990). Insect life cycles: genetics, evolution, and co-ordination. New York: Springer-Verlag. p. 258. ISBN 0387195505. http://www.cefe.cnrs.fr/coev/pdf/fk/Addicot1990.pdf. ^ Sherman, P. W.; Lacey, E. A.; Reeve, H. K.; Keller, L. (1995). "The eusociality continuum". Behavioural Ecology 6 (1): 102–108. http://www.nbb.cornell.edu/neurobio/BioNB427/READINGS/ShermanEtAl1995.pdf. ^ Wilson, D. S.; Wilson, E. O. (2007). "Rethinking the theoretical foundation of sociobiology" ([dead link]). The Quarterly Review of Biology, December 2007, Vol. 82, No. 4 82 (4): 327–348. http://evolution.binghamton.edu/dswilson/resources/publications_resources/Rethinking%20sociobiology.pdf. ^ Amundsen, T.; Slagsvold, T. (1996). "Lack's Brood Reduction Hypothesis and Avian Hatching Asynchrony: What's Next?". Oikos 76 (3): 613–620. doi:10.2307/3546359. http://jstor.org/stable/3546359. ^ Pijanowski, B. C. (1992). "A Revision of Lack's Brood Reduction Hypothesis". The American Naturalist 139 (6): 1270–1292. doi:10.1086/285386. ^ Kodric-Brown, A.; Brown, J. H. (1984). "Truth in advertising: The kinds of traits favored by sexual selection". The American Naturalist 124 (3): 309–323. doi:10.1086/284275. http://dbs.umt.edu/courses/biol406/readings/Wk6-Kodric-Brown%20and%20Brown%201984.pdf. ^ a b Parenti, L. R.; Ebach, M. C. (2009). Comparative biogeography: Discovering and classifying biogeographical patterns of a dynamic Earth.. London, England: University of California Press. ISBN 978-0-520-25945-4. http://books.google.com/?id=K1GU_1I6bG4C&printsec=frontcover. ^ a b MacArthur, R.; Wilson, E. O. (1967). The Theory of Island Biogeography. Princeton, NJ: Princeton University Press. ^ a b Wiens, J. J.; Donoghue, M. J. (2004). "Historical biogeography, ecology and species richness". Trends in Ecology and Evolution 19 (12): 639–644. doi:10.1016/j.tree.2004.09.011. PMID 16701326. http://www.phylodiversity.net/donoghue/publications/MJD_papers/2004/144_Wiens_TREE04.pdf. ^ a b Croizat, L.; Nelson, G.; Rosen, D. E. (1974). "Centers of Origin and Related Concepts". Systematic Zoology 23 (2): 265–287. doi:10.2307/2412139. http://www.jstor.org/stable/2412139. ^ Wiley, E. O. (1988). "Vicariance Biogeography". Annual Review of Ecology and Systematics 19: 513–542. doi:10.1146/annurev.es.19.110188.002501. http://www.jstor.org/stable/2097164. ^ Morrone, J. J.; Crisci, J. V. (1995). "Historical Biogeography: Introduction to Methods". Annual Review of Ecology and Systematics 26: 373–401. doi:10.1146/annurev.es.26.110195.002105. ^ Landhäusser, Simon M.; Deshaies, D.; Lieffers, V. J. (2009). "Disturbance facilitates rapid range expansion of aspen into higher elevations of the Rocky Mountains under a warming climate". Journal of Biogeography 37 (1): 68–76. doi:10.1111/j.1365-2699.2009.02182.x. ^ Reznick, D.; Bryant, M. J.; Bashey, F. (2002). "r- and K-Selection Revisited: The Role of Population Regulation in Life-History Evolution". Ecology 83 (6): 1509–1520. doi:10.1890/0012-9658(2002)083[1509:RAKSRT]2.0.CO;2. http://www2.hawaii.edu/~taylor/z652/Reznicketal.pdf. ^ Pianka, E. R. (1972). "r and K Selection or b and d Selection?". The American Naturalist 106 (951): 581–588. doi:10.1086/282798. ^ Avise, J. (1994). Molecular Markers, Natural History and Evolution. Kluwer Academic Publishers. ISBN 0-412-03771-8. http://books.google.com/?id=2zYnQfnXNr8C&printsec=frontcover. ^ O'Brian, E.; Dawson, R. (2007). "Context-dependent genetic benefits of extra-pair mate choice in a socially monogamous passerine". Behav Ecol Sociobiol 61: 775–782. doi:10.1007/s00265-006-0308-8. http://web.unbc.ca/~dawsonr/2007_bes61_775-782.pdf. ^ Avise, J. (2000). Phylogeography: The History and Formation of Species. President and Fellows of Harvard College. ISBN 0-674-66638-0. http://books.google.com/?id=lA7YWH4M8FUC&printsec=frontcover. ^ Mason, H. L.; Langenheim, J. H. (1957). "Language Analysis and the Concept "Environment"". Ecology 38 (2): 325–340. doi:10.2307/1931693. http://www.jstor.org/stable/1931693. ^ Kleese, D. A. (2001). "Nature and nature in Psychology.". Journal of Theoretical and Philosophical Psy. 21: 61–79. doi:10.1037/h0091199. ^ a b c d e Kormondy, E. (1995). Concepts of ecology. (4th ed.). Benjamin Cummings. ISBN 0134781163. ^ Billings, W. D. (1952). "The Environmental Complex in Relation to Plant Growth and Distribution". The Quarterly Review of Biology 27 (3): 251–265. doi:10.1086/399022. PMID 13004274. http://www.jstor.org/pss/2813531. ^ Singh, J. S. (2006). "Sustainable development of the Indian Himalayan region: Linking ecological and economic concerns". Current Science 90 (6): 784–788. http://www.ias.ac.in/currsci/mar252006/784.pdf. ^ Marcello, A. (1958). "Climate, plant migration and rhythm". International Journal of Biometeorology 2 (1): 105–107. doi:10.1007/BF02333488. ^ Mikkelson, G. M. (In Press.). Skipper, R. A.; Ankeny, L.; Allen, C. et al.. eds. Part-whole Relationships and the unity of ecology. In, Philosophy across the Life Sciences.. Cambridge, MA. : MIT Press.. http://webpages.mcgill.ca/staff/Group3/gmikke/web/pwrue.pdf. ^ a b Wilson, D. S. (1988). "Holism and Reductionism in Evolutionary Ecology". Oikos 53 (2): 269–273. doi:10.2307/3566073. http://www.jstor.org/stable/3566073. ^ Ernst, S. K. Morgan; Enquist, Brian J.; Brown, James H.; Charnov, E. L.; Gillooly, J. F.; Savage, Van M.; et al., Ethan P.; Smith, Felisa A. et al. (2003). "Thermodynamic and metabolic effects on the scaling of production and population energy use". Ecology Letters 6: 990–995. doi:10.1046/j.1461-0248.2003.00526.x. https://www.msu.edu/~maurerb/Ernest_etal_2003.pdf. ^ Allègre, Claude J.; Manhès, Gérard; Göpel, Christa (1995). "The age of the Earth". Geochimica et Cosmochimica Acta 59: 1455–1456. doi:10.1016/0016-7037(95)00054-4. ^ Wills, C.; Bada, J. (2001). The Spark of Life: Darwin and the Primeval Soup. Cambridge, Massachusetts: Perseus Publishing. ISBN 9780738204932. http://books.google.com/?id=UrGqxy0wMdkC&dq=The+Spark+of+Life:+Darwin+and+the+Primeval+Soup&printsec=frontcover. ^ a b Goldblatt, C.; Lenton, T. M.; Watson, A. J. (2006). "Bistability of atmospheric oxygen and the Great Oxidation". Nature 443 (7112): 683–686. doi:10.1038/nature05169. PMID 17036001. http://lgmacweb.env.uea.ac.uk/ajw/Reprints/goldblatt_et_al_2006.pdf. ^ Catling, D. C.; Claire, M. W. (2005). "How Earth’s atmosphere evolved to an oxic state: A status report". Earth and Planetary Science Letters 237: 1–20. doi:10.1016/j.epsl.2005.06.013. http://www.atmos.washington.edu/~davidc/papers_mine/Catling2005-EPSL.pdf. ^ a b c d Cronk, J. K.; Fennessy, M. S. (2001). Wetland Plants: Biology and Ecology. Washington, D.C.: Lewis Publishers. ISBN 1-56670-372-7. http://books.google.com/?id=FNI1GFbH2eQC&printsec=frontcover. ^ Evans, D. H.; Piermarini, P. M.; Potts, W. T. W. (1999). "Ionic Transport in the Fish Gill Epithelium". Journal of Experimental Zoology 283: 641–652. doi:10.1002/(SICI)1097-010X(19990601)283:7<641::AID-JEZ3>3.0.CO;2-W. http://people.biology.ufl.edu/devans/DHEJEZ.pdf. ^ Swenson, N. G.; Enquist, B. J. (2008). "The relationship between stem and branch wood specific gravity and the ability of each measure to predict leaf area.". American Journal of Botany 95: 516–519. doi:10.3732/ajb.95.4.516. ^ Gartner, G. e. a.; Hicks, JW; Manzani, PR; Andrade, DV; Abe, AS; Wang, T; Secor, SM; Garland Jr, T (2010). "Phylogeny, Ecology, and Heart Position in Snakes". Physiological and Biochemical Zoology 83 (1): 43–54. doi:10.1086/648509. PMID 19968564. http://www.naherpetology.org/pdf_files/1407.pdf. ^ Jacobsen, D. (2008). "Low oxygen pressure as a driving factor for the altitudinal decline in taxon richness of stream macroinvertebrates.". Oecologia 154 (4): 795–807. doi:10.1007/s00442-007-0877-x. PMID 17960424. ^ Wheeler, T. D.; Stroock, A. D. (2008). "The transpiration of water at negative pressures in a synthetic tree". Nature 455 (7210): 208–212. doi:10.1038/nature07226. PMID 18784721. ^ Pockman, W. T.; Sperry, J. S.; O'Leary, J. W. (1995). "Sustained and significant negative water pressure in xylem". Nature 378: 715–716. doi:10.1038/378715a0. ^ Kastak, D.; Schusterman, R. J. (1998). "Low-frequency amphibious hearing in pinnipeds: Methods, measurements, noise, and ecology". J. Acoust. Soc. Am. 103 (4): 2216–2228. doi:10.1121/1.421367. PMID 9566340. http://www.sea-inc.net/resources/lrni_KastakandSchusterman_JASA_LFpinnipedhearing_1998.pdf. ^ Friedman, J.; Harder, L. D. (2004). "Inflorescence architecture and wind pollination in six grass species". Functional Ecology 18 (6): 851–860. doi:10.1111/j.0269-8463.2004.00921.x. http://www.bio.ucalgary.ca/contact/faculty/pdf/FriedmanHarder2004.pdf. ^ Harder, L. D.; Johnson, S. D. (2009). "Darwin’s beautiful contrivances: evolutionary and functional evidence for floral adaptation.". New Phytologist 183 (3): 530–545. doi:10.1111/j.1469-8137.2009.02914.x. PMID 19552694. http://www.bio.ucalgary.ca/contact/faculty/pdf/Harder_Johnson_09.pdf. ^ Shimeta, J.; Jumars, P. A.; Lessard, E. J. (1995). "Influences of turbulence on suspension feeding by planktonic protozoa; experiments in laminar shear fields". Limnolology and Oceanography 40 (5): 845–859. doi:10.4319/lo.1995.40.5.0845. http://www.aslo.org/lo/toc/vol_40/issue_5/0845.pdf. ^ Etemad-Shahidi, A.; Imberger, J. (2001). "Anatomy of turbulence in thermally stratified lakes". Limnolology and Oceanography 46 (5): 1158–1170. doi:10.4319/lo.2001.46.5.1158. http://nospam.aslo.org/lo/toc/vol_46/issue_5/1158.pdf. ^ Wolf, B. O.; Walsberg, G. E. (2006). "Thermal Effects of Radiation and Wind on a Small Bird and Implications for Microsite Selection". Ecology 77 (7): 2228–236. doi:10.2307/2265716. http://www.jstor.org/stable/2265716. ^ Daubenmire, R. (1975). "Floristic plant geography of eastern Washington and northern Idaho.". Journal of Biogeography 2 (1): 1–18. doi:10.2307/3038197. http://www.jstor.org/stable/3038197. ^ Steele, C. A.; Carstens, B. C.; Storfer, A.; Sullivan, J. (2005). "Testing hypotheses of speciation timing in Dicamptodon copei and Dicamptodon aterrimus (Caudata: Dicamptodontidae).". Molecular Phylogenetics and Evolution 36 (1): 90–100. doi:10.1016/j.ympev.2004.12.001. PMID 15904859. http://www.lsu.edu/faculty/carstens/pdfs/Steele.etal.2005.pdf. ^ "Photosynthesis and respiration". Natural Resources Canada. http://ecosys.cfl.scf.rncan.gc.ca/dynamique-dynamic/respiration-eng.asp. Retrieved 4 February 2010. ^ Lenton, T. M.; Watson, A. (2000). "Redfield revisited 2. What regulates the oxygen content of the atmosphere.". Global biogeochemical cycles 14 (1): 249–268. doi:10.1029/1999GB900076. http://lgmacweb.env.uea.ac.uk/esmg/papers/Redfield_revisited_2.pdf. ^ Lobert, J. M.; Warnatz, J. (1993). Crutzen, P. J.; Goldammer, J. G.. eds. Emissions from the combustion process in vegetation.. John Wiley & Sons. ISBN 0471936049, 9780471936046. http://jurgenlobert.org/papers_data/Lobert.Warnatz.Wiley.1993.pdf. ^ Garren, K. H. (1943). "Effects of Fire on Vegetation of the Southeastern United States". Botanical Review 9 (9): 617–654. doi:10.1007/BF02872506. ^ Cooper, C. F. (1960). "Changes in Vegetation, Structure, and Growth of Southwestern Pine Forests since White Settlement". Ecological Monographs 30 (2): 130–164. http://www.jstor.org/stable/1948549. ^ Cooper, C. F. (1961). "The ecology of fire". Scientific American 204: 150–160. doi:10.1038/scientificamerican0461-150. ^ van Wagtendonk, Jan W. (2007). "History and Evolution of Wildland Fire Use". Fire Ecology Special Issue 3 (2): 3–17. http://fireecology.net/Journal/pdf/Volume03/Issue02/003.pdf. ^ Boerner, R. e. j. (1982). "Fire and Nutrient Cycling in Temperate Ecosystems". BioScience 32 (3): 187–192. doi:10.2307/1308941. http://www.jstor.org/stable/1308941. ^ Goubitz, S.; Werger, M. J. A.; Ne'eman, G. (2009). "Germination Response to Fire-Related Factors of Seeds from Non-Serotinous and Serotinous Cones". Plant Ecology 169 (2): 195–204. doi:10.1023/A:1026036332277. ^ Ne'eman, G.; Goubitz, S.; Nathan, R. (2004). "Reproductive Traits of Pinus halepensis in the Light of Fire: A Critical Review". Plant Ecology 171 (1/2): 69–79. doi:10.1023/B:VEGE.0000029380.04821.99. ^ Flematti, Gavin R.; Ghisalberti, Emilio L.; Dixon, Kingsley W.; Trengove, R. D. (2004). "A Compound from Smoke That Promotes Seed Germination". Science 305. no. 5686, p. 977 (5686): 977. http://www.ice.mpg.de/main/news/positions/itb-004/DixonSmokepaper.pdf. ^ Falkowski, P. G.; Fenchel, T.; Delong, E. F. (2008). "The microbial engines that drive Earth’s biogeochemical cycles". Science 320 (5879): 1034–9. doi:10.1126/science.1153213. PMID 18497287. ^ Grace, J. (2004). "Understanding and managing the global carbon cycle". Journal of Ecology 92: 189–202. doi:10.1111/j.0022-0477.2004.00874.x. ^ Pearson, P. N.; Palmer, M. R. (2000). "Atmospheric carbon dioxide concentrations over the past 60 million years". Nature 406 (6797): 695–699. doi:10.1038/35021000. PMID 10963587. http://paleolands.com/pdf/cenozoicCO2.pdf. ^ Pagani, M.; Zachos, J. C.; Freeman, K. H.; Tipple, B.; Bohaty, S. (2005). "Marked Decline in Atmospheric Carbon Dioxide Concentrations During the Paleogene" ([dead link]). Science 309 (5734): 600–603. doi:10.1126/science.1110063. PMID 15961630. http://earth.geology.yale.edu/~mp364data/Pagani.Science.2005.pdf. ^ Cox, P. M.; Betts, R. A.; Jones, C. D.; Spall, S. A.; Totterdell, I. J. (2000). "Acceleration of global warming due to carbon-cycle feedbacks in a coupled climate model". Nature 408 (6809): 184–187. doi:10.1038/35041539. PMID 11089968. https://www.up.ethz.ch/education/biogeochem_cycles/reading_list/cox_etal_nat_00.pdf. ^ Heimann, Martin; Reichstein, Markus (2008). "Terrestrial ecosystem carbon dynamics and climate feedbacks". Nature 451 (7176): 289–292. doi:10.1038/nature06591. PMID 18202646. http://courses.washington.edu/ocean450/Discussion_Topics_Papers/Heinmann_clim_chng_08.pdf. ^ a b Egerton, F. N. (2001). "A History of the Ecological Sciences: Early Greek Origins". Bulletin of the Ecological Society of America 82 (1): 93–97. http://www.jstor.org/stable/20168519?seq=1. ^ Keller, D. R.; Golley, F. B. (2000). The philosophy of ecology: from science to synthesis.. Athens, Georgia: University of Georgia Press. ISBN 978-0820322209. http://books.google.com/?id=uYOxUAJThJEC&pg=PP1. ^ Real, L. A.; Brown, J. H. (1992). Foundations of ecology: classic papers with commentaries.. Chicago: University of Chicago Press. ISBN 978-0226705941. http://books.google.com/?id=y2wwTZgrHmYC&dq=Foundations+of+ecology:+classic+papers+with+commentaries.&cd=1. ^ Kingsland, S. (2004). "Conveying the intellectual challenge of ecology: an historical perspective". Frontiers in Ecology and the Environment 2 (7): 367–374. doi:10.1890/1540-9295(2004)002[0367:CTICOE]2.0.CO;2. http://www.isa.utl.pt/dbeb/ensino/txtapoio/HistEcology.pdf. ^ a b McIntosh, R. (1985). The Background of Ecology: Concept and Theory.. New York: Cambridge University Press. ISBN 0-521-24935. http://books.google.com/?id=1bYSnG7RITAC&pg=PP1. ^ a b Esbjorn-Hargens, S. (2005). "Integral Ecology: An Ecology of Perspectives". Journal of Integral Theory and Practice 1 (1): 2–37. http://www.vancouver.wsu.edu/fac/tissot/IU_Ecology_Intro.pdf. ^ Hinchman, L. P.; Hinchman, S. K. (2007). "What we owe the Romantics". Environmental Values 16 (3): 333–354. doi:10.3197/096327107X228382. ^ Goodland, R. J. (1975). "The Tropical Origin of Ecology: Eugen Warming's Jubilee". Oikos 26 (2): 240–245. doi:10.2307/3543715. http://www.jstor.org/pss/3543715. ^ a b Kormandy, E. J.; Wooster, Donald (1978). "Review: Ecology/Economy of Nature--Synonyms?". Ecology 59 (6): 1292–1294. doi:10.2307/1938247. http://www.jstor.org/pss/1938247. ^ Stauffer, R. C. (1957). "Haeckel, Darwin and ecology.". The Quarterly Review of Biology 32 (2): 138–144. doi:10.1086/401754. http://www.clt.astate.edu/aromero/ECO3.Haeckel.pdf. ^ Rosenzweig, M.L. (2003). "Reconciliation ecology and the future of species diversity". Oryx 37 (2): 194–205. http://eebweb.arizona.edu/COURSES/Ecol302/Lectures/ORYXRosenzweig.pdf. ^ Hawkins, B. A. (2001). "Ecology's oldest pattern." ([dead link]). Endeavor 25 (3): 133. doi:10.1016/S0160-9327(00)01369-7. http://www4.ncsu.edu/~rrdunn/Hawkins%202001.pdf. ^ Hughes, J. D. (1985). "Theophrastus as Ecologist". Environmental Review 9 (4): 296–306. doi:10.2307/3984460. http://www.jstor.org/stable/info/3984460?seq=1. ^ Hughes, J. D. (1975). "Ecology in ancient Greece". Inquiry 18 (2): 115–125. http://www.informaworld.com/smpp/content~db=all~content=a902027058. ^ a b Hector, A.; Hooper, R. (2002). "Darwin and the First Ecological Experiment". Science 295 (5555): 639–640. doi:10.1126/science.1064815. PMID 11809960. ^ Sinclair, G. (1826). "On cultivating a collection of grasses in pleasure-grounds or flower-gardens, and on the utility of studying the Gramineae.". London Gardener's Magazine (New-Street-Square: A. & R. Spottiswoode) 1: p. 115. http://books.google.com/?id=fF0CAAAAYAAJ&pg=PA230. ^ Benson, Keith R. (2000). "The emergence of ecology from natural history". Endeavour 24 (2): 59–62. doi:10.1016/S0160-9327(99)01260-0. PMID 10969480. ^ Darwin, Charles (1859). On the Origin of Species (1st ed.). London: John Murray. p. 1. ISBN 0801413192. http://darwin-online.org.uk/content/frameset?itemID=F373&viewtype=text&pageseq=16. ^ Meysman, f. j. r.; Middelburg, Jack J.; Heip, C. H. R. (2006). "Bioturbation: a fresh look at Darwin’s last idea". TRENDS in Ecology and Evolution 21 (22): 688–695. doi:10.1016/j.tree.2006.08.002. PMID 16901581. http://www.marbee.fmns.rug.nl/pdf/marbee/2006-Meysman-TREE.pdf. ^ Acot, P. (1997). "The Lamarckian Cradle of Scientific Ecology". Acta Biotheoretica 45 (3-4): 185–193. doi:10.1023/A:1000631103244. ^ Forbes, S. (1887). "The lake as a microcosm". Bull. of the Scientific Association (Peoria, IL): 77–87. http://www.uam.es/personal_pdi/ciencias/scasado/documentos/Forbes.PDF. ^ Clements, F. E. (1905). Research Methods in Ecology. Lincoln, Nebraska: University Publ.. ISBN 0405103816. ^ Simberloff, D. (1980). "A succession of paradigms in ecology: Essentialism to materialism and probalism.". Synthese 43 (1980) 3-39: 3–39. ^ Gleason, H. A. (1926). "The Individualistic Concept of the Plant Association". Bulletin of the Torrey Botanical Club 53 (1): 7–26. doi:10.2307/2479933. http://www.ecologia.unam.mx/laboratorios/comunidades/pdf/pdf%20curso%20posgrado%20Elena/Tema%201/gleason1926.pdf. ^ a b c d Liu, J.; Dietz, T.; Carpenter, S. R.; Folke, C.; Alberti, M.; Redman, C. L.; et al., Stephen H.; Ostrom, Elinor et al. (2009). "Coupled Human and Natural Systems". AMBIO: A Journal of the Human Environment 36 (8): 639–649. doi:10.1579/0044-7447(2007)36[639:CHANS]2.0.CO;2. http://ambio.allenpress.com/archive/0044-7447/36/8/pdf/i0044-7447-36-8-639.pdf. ^ Foster, J. B.; Clark, B. (2008). "The Sociology of Ecology: Ecological Organicism Versus Ecosystem Ecology in the Social Construction of Ecological Science, 1926-1935". Organization & Environment 21 (3): 311–352. doi:10.1177/1086026608321632. http://ibcperu.nuxit.net/doc/isis/10408.pdf. ^ Weltzin, J. F.; Belote, R. T.; Williams, L. T.; Keller, J. K.; Engel, E. C. (2006). "Authorship in ecology: attribution, accountability, and responsibility". Frontiers in Ecology and the Environment 4 (8): 435–441. doi:10.1890/1540-9295(2006)4[435:AIEAAA]2.0.CO;2. http://www.biology.duke.edu/jackson/ecophys/WeltzinFrontiers2006.pdf. ^ McIntosh, R. P. (1989). "Citation Classics of Ecology". The Quarterly Review of Biology 64 (1): 31–49. doi:10.1086/416129. http://www.jstor.org/pss/2831684. ^ a b Ghilarov, A. M. (1995). "Vernadsky's Biosphere Concept: An Historical Perspective". The Quarterly Review of Biology 70 (2): 193–203. doi:10.1086/418982. http://www.jstor.org/pss/3036242. ^ Itô, Y. (1991). "Development of ecology in Japan, with special reference to the role of Kinji Imanishi". Journal of Ecological Research 6 (2): 139–155. doi:10.1007/BF02347158. ^ Becker, C. D.; Ostrom, E. (1995). "Human Ecology and Resource Sustainability: The Importance of Institutional Diversity". Annual Review of Ecology and Systematics 26: 113–133. doi:10.1146/annurev.es.26.110195.000553. http://www.umich.edu/~ifri/Publications/R95I_20.pdf. ^ Hartig, T. (2008). "Green space, psychological restoration, and health inequality". The Lancet 372 (9650): 1614–1615. doi:10.1016/S0140-6736(08)61669-4. ^ Pickett, S. t. a.; Cadenasso, M. L. (2007). "Linking ecological and built components of urban mosaics: an open cycle of ecological design". Journal of Ecology 96: 8–12. http://www.ecostudies.org/pickett/2008_Ecological_Built_J_Ecol.pdf. ^ Termorshuizen, J. W.; Opdam, P.; van den Brink, A. (2007). "Incorporating ecological sustainability into landscape planning". Landscape and Urban Planning 79 (3-4): 374–384. doi:10.1016/j.landurbplan.2006.04.005. http://www.ontwerpenmetnatuur.wur.nl/NR/rdonlyres/EBE08632-E0F4-4DA1-ACDE-5C4C0710056C/44955/termorshuizenetal.pdf. ^ Díaz, S.; Fargione, J.; Chapin, F. S.; Tilman, D. (2006). "Biodiversity Loss Threatens Human Well-Being.". PLoS Biol 4 (8): e277. doi:10.1371/journal.pbio.0040277. PMID 16895442. ^ Ostrom, E.; Burger, J.; Field, C. B.; Norgaard, R. B.; Policansky, D. (1999). "Revisiting the Commons: Local Lessons, Global Challenges". Science 284: 278–28. doi:10.1126/science.284.5412.278. http://isites.harvard.edu/fs/docs/icb.topic464862.files/Revisiting_the_Commons.pdf. ^ "Millennium Ecosystem Assessment - Synthesis Report". United Nations. 2005. http://www.millenniumassessment.org/en/Synthesis.aspx. Retrieved 4 February 2010. ^ Sienkiewicz, A. (2006). "Toward a Legal Land Ethic: Punitive Damages, Natural Value, and the Ecological Commons". Penn State Environmental Law Review 91: 95–96. https://litigation-essentials.lexisnexis.com/webcd/app?action=DocumentDisplay&crawlid=1&doctype=cite&docid=15+Penn+St.+Envtl.+L.+Rev.+91&srctype=smi&srcid=3B15&key=6d0993165c3d310fcc3ceb54672154db. ^ de Groot, R. S.; Wilson, M. A.; Boumans, R. M. J. (2002). "A typology for the classification, description and valuation of ecosystem functions, goods and services". Ecological Economics 41: 393–408. doi:10.1016/S0921-8009(02)00089-7. http://yosemite.epa.gov/SAB/sabcvpess.nsf/e1853c0b6014d36585256dbf005c5b71/1c7c986c372fa8d485256e29004c7084/$FILE/deGroot%20et%20al.pdf. ^ a b Costanza, R.; d'Arge, R.; de Groot, R.; Farberk, S.; Grasso, M.; Hannon, B.; et al., Karin; Naeem, Shahid et al. (1997). "The value of the world’s ecosystem services and natural capital.". Nature 387: 253–260. doi:10.1038/387253a0. http://www.uvm.edu/giee/publications/Nature_Paper.pdf. ^ a b Rees, W. E. (1992). "Ecological footprints and appropriated carrying capacity: what urban economics leaves out.". Environment and Urbanization 4 (2): 121–130. doi:10.1177/095624789200400212. ^ "Living Planet Report 2008". Worldwide Wildlife Fun. http://assets.panda.org/downloads/living_planet_report_2008.pdf. Retrieved 4 February 2010. ^ a b Moran, D. D.; Wakernagel, M.; Kitzesa, J. A.; Goldfinger, S. H.; Boutau, A. (2008). "Measuring sustainable development — Nation by nation". Ecological Economics 64: 470–474. doi:10.1016/j.ecolecon.2007.08.017. http://www.rshanthini.com/tmp/CP551/M02R02_MeasuringSDwithHDIandEF.pdf. ^ Rees, W. (2002). "An Ecological Economics Perspective on Sustainability and Prospects for Ending Poverty". Population & Environment 24 (1): 15–46. doi:10.1023/A:1020125725915. ^ Dasgupta, P. (2008). "Creative Accounting". Nature Frontiers 456: 44. doi:10.1038/twas08.44a. ^ Wackernagel, M.; Rees, W. E. (1997). "Perceptual and structural barriers to investing in natural capital: Economics from an ecological footprint perspective". Ecological Economics 20 (1): 3–24. doi:10.1016/S0921-8009(96)00077-8. ^ Pastor, J.; Light, S.; Sovel, L. (1998). "Sustainability and resilience in boreal regions: sources and consequences of variability.". Conservation Ecology 2 (2): 16. http://www.consecol.org/vol2/iss2/art16/. ^ Zalasiewicz, J.; Williams, M.; Alan, S.; Barry, T. L.; Coe, A. L.; Bown, P. R.; et al., Patrick; Cantrill, David et al. (2008). "Are we now living in the Anthropocene". GSA Today 18 (2): 4–8. doi:10.1130/GSAT01802A.1. http://www.see.ed.ac.uk/~shs/Climate%20change/Geo-politics/Anthropocene%202.pdf. ^ a b Wake, D. B.; Vredenburg, V. T. (2008). "Are we in the midst of the sixth mass extinction? A view from the world of amphibians". PNAS 105: 11466–11473. doi:10.1073/pnas.0801921105. PMID 18695221. ^ May, R. M. (2010). "Ecological science and tomorrow's world". Philosophical transactions of the Royal Society of London. Series B, Biological sciences 365 (1537): 41–47. doi:10.1098/rstb.2009.0164. PMID 20008384. ^ Mooney, H.; Larigauderie, A.; Cesario, M.; Elmquist, T.; Hoegh-Guldberg, O.; Lavorel, S.; et al., Georgina M; Palmer, Margaret et al. (2009). "Biodiversity, climate change, and ecosystem services Current Opinion in Environmental Sustainability". Current Opinion in Environmental Sustainability 1 (1): 46–54. doi:10.1016/j.cosust.2009.07.006. ^ Chapin, F. S.; Zaveleta, E. S.; Eviner, V. T.; Naylor, R. L.; Vitousek, P. M.; Reynolds, H. L.; et al., DU; Lavorel, S et al. (2000). "Consequences of changing biodiversity". Nature 405 (6783): 234–242. doi:10.1038/35012241. PMID 10821284. ^ Ehrlich, P. R.; Pringle, R. M. (2008). "Where does biodiversity go from here? A grim business-as-usual forecast and a hopeful portfolio of partial solutions.". Proceedings of the National Academy of Sciences 105 (S1): 11579–11586. doi:10.1073/pnas.0801911105. PMID 18695214. ^ Koh, L. P.; Dunn, R. R.; Sodhi, N. S.; Colwell, R. K.; Proctor, H. C.; Smith, V. (2004). Koh%20et%20al%202004%20extinction.pdf "Species Coextinctions and the Biodiversity Crisis". Science 305 (5690): 1632–1634. doi:10.1126/science.1101101. PMID 15361627. http://www.unalmed.edu.co/~poboyca/documentos/documentos1/Biolog%EDa_Conservacion/03_2008/Polania/Set_03 Koh%20et%20al%202004%20extinction.pdf. ^ Western, D. (1992). "The Biodiversity Crisis: A Challenge for Biology". Oikos 63 (1): 29–38. doi:10.2307/3545513. http://www.jstor.org/pss/3545513. ^ Jackson JB (2008). "Colloquium paper: ecological extinction and evolution in the brave new ocean". Proc. Natl. Acad. Sci. U.S.A. 105 (Suppl 1): 11458–65. doi:10.1073/pnas.0802812105. PMID 18695220. ^ "The Economics of Ecosystems and Biodiversity". European Union. http://ec.europa.eu/environment/nature/biodiversity/economics/. Retrieved 4 February 2010. ^ Edwards, P. J.; Abivardi, C. (1998). "The value of biodiversity: Where ecology and economy blend". Biological Conservation 83 (2): 239–246. doi:10.1016/S0006-3207(97)00141-9. ^ Naidoo, R.; Malcolm, T.; Tomasek, A. (2009). "Economic benefits of standing forests in highland areas of Borneo: quantification and policy impacts". Conservation Letters 2: 35–44. http://www.azoresbioportal.angra.uac.pt/files/publicacoes_Naiddo%20et%20al2009.pdf. ^ Zhoua, X.; Al-Kaisib, M.; Helmers, M. J. (2009). "Cost effectiveness of conservation practices in controlling water erosion in Iowa". Soil and Tillage Research 106 (1): 71–78. doi:10.1016/j.still.2009.09.015. ^ Jonsson, M.; Wardle, D. A. (2009). "Structural equation modelling reveals plant-community drivers of carbon storage in boreal forest ecosystems". Biology Letters 6 (1): 1–4. doi:10.1098/rsbl.2009.0613. PMID 19755530. ^ Ferguson, K. (2006). "The True Value of Forests". Frontiers in Ecology and the Environment 4 (9): 456. http://www.jstor.org/pss/3868812. ^ Anielski, M.; Wilson, S. (2005). "Counting Canada’s Natural Capital: Assessing the Real value of Canada’s Boreal Ecosystems" ([dead link]). http://www.borealcanada.ca/pr_docs/Boreal_Wealth_Report_Nov_2005.pdf. ^ Wakernagel, M.; Rees, W. E. (1997). "Perceptual and structural barriers to investing in natural capital: Economics from an ecological footprint perspective.". Ecological Economics 20 (1): 3–24. doi:10.1016/S0921-8009(96)00077-8. Allee, W. C. (1932). Animal life and social growth. Baltimore: The Williams & Wilkins Company and Associates. Allee, W.; Emerson, A. E., Park, O., Park, T., and Schmidt, K. P. (1949). Principles of Animal Ecology. W. B. Saunders Company. ISBN 0721611206. Begon, M.; Townsend, C. R., Harper, J. L. (2006). Ecology: From individuals to ecosystems. (4th ed.). Blackwell. ISBN 1405111178. Brinson, M. M.; Lugo, A. E.; Brown, S. (1984). "Primary Productivity, Decomposition and Consumer Activity in Freshwater Wetlands.". Annual Review of Ecology and Systematics 12: 123–161. doi:10.1146/annurev.es.12.110181.001011. http://www.jstor.org/stable/2097108. Clements, F. E. (1905). Research Methods in Ecology. Lincoln, Nebraska: University Publ.. ISBN 0405103816. Costanza, R.; d'Arge, R.; de Groot, R.; Farberk, S.; Grasso, M.; Hannon, B.; et al., Karin; Naeem, Shahid et al. (1997). "The value of the world’s ecosystem services and natural capital.". Nature 387: 253–260. doi:10.1038/387253a0. http://www.uvm.edu/giee/publications/Nature_Paper.pdf. Davic, R. D.; Welsh, H. H. (2004). "On the Ecological Role of Salamanders". Annual Review of Ecology and Systematics 35: 405–434. doi:10.1146/annurev.ecolsys.35.112202.130116. Elton, C. S. (1927). Animal Ecology. London, UK. : Sidgwick and Jackson. ISBN 0226206394. Forbes, S. (1887). "The lake as a microcosm". Bull. of the Scientific Association (Peoria, IL : . ): 77–87. http://www.uam.es/personal_pdi/ciencias/scasado/documentos/Forbes.PDF. Gleason, H. A. (1926). "The Individualistic Concept of the Plant Association". Bulletin of the Torrey Botanical Club 53 (1): 7–26. doi:10.2307/2479933. http://www.ecologia.unam.mx/laboratorios/comunidades/pdf/pdf%20curso%20posgrado%20Elena/Tema%201/gleason1926.pdf. Hanski, I. (2008). "The world that became ruined.". EMBO reports 9: S34–S36. doi:10.1038/embor.2008.77. PMID 18578021. http://www.helsinki.fi/~ihanski/Articles/EMBO%202008%20Hanski.pdf. Hastings, A. B.; Crooks, J. E.; Cuddington, J. A.; Jones, K.; Lambrinos, C. J.; Talley, J. G.; et al., TS; Wilson, WG (2007). "Ecosystem engineering in space and time". Ecology Letters 10 (2): 153–164. doi:10.1111/j.1461-0248.2006.00997.x. PMID 17257103. Kormondy, E. (1995). Concepts of ecology. (4th ed.). Benjamin Cummings. ISBN 0134781163. Liu, J.; Dietz, T.; Carpenter, S. R.; Folke, C.; Alberti, M.; Redman, C. L.; et al., Stephen H.; Ostrom, Elinor et al. (2009). "Coupled Human and Natural Systems". AMBIO: A Journal of the Human Environment 36 (8): 639–649. doi:10.1579/0044-7447(2007)36[639:CHANS]2.0.CO;2. http://ambio.allenpress.com/archive/0044-7447/36/8/pdf/i0044-7447-36-8-639.pdf. Lovelock, J. (2003). "The living Earth". Nature 426 (6968): 769–770. doi:10.1038/426769a. PMID 14685210. McIntosh, R. (1985). The Background of Ecology: Concept and Theory.. New York: Cambridge University Press. ISBN 0-521-24935. http://books.google.com/?id=1bYSnG7RITAC&pg=PP1. McIntosh, R. P. (1989). "Citation Classics of Ecology". The Quarterly Review of Biology 64 (1): 31–49. doi:10.1086/416129. http://www.jstor.org/pss/2831684. Odum, E. P. (1977). "The emergence of ecology as a new integrative discipline". Science 195 (4284): 1289–1293. doi:10.1126/science.195.4284.1289. PMID 17738398. Odum, E. P.; Brewer, R. W.; Barrett, G. W. (2004). Fundamentals of Ecology (Fifth ed.). Brooks Cole. ISBN 978-0534420666. Omerod, S.J. ; Pienkowski, M.W. ; Watkinson, A.R. (1999). "Communicating the value of ecology". Journal of Applied Ecology 36: 847–855. doi:10.1046/j.1365-2664.1999.00474.x. Rickleffs, Robert, E. (1996). The Economy of Nature. University of Chicago Press. p. 678. ISBN 0716738473. Smith, R.; Smith, R. M. (2000). Ecology and Field Biology. (6th ed.). Prentice Hall. ISBN 0321042905. Whittaker, R. H.; Levin, S. A.; Root, R. B. (1973). "Niche, Habitat, and Ecotope". The American Naturalist 107 (955): 321–338. doi:10.1086/282837. http://www.jstor.org/stable/2459534?seq=6. Wiens, J. J.; Graham, C. H. (2005). "Integrating Evolution, Ecology, and Conservation Biology". Annual Review of Ecology, Evolution, and Systematics 36: 519–539. doi:10.1146/annurev.ecolsys.36.102803.095431. http://life.bio.sunysb.edu/ee/grahamlab/pdf/Wiens_Graham_AnnRev2005.pdf. Science Aid: Ecology High School (GCSE, Alevel) Ecology.